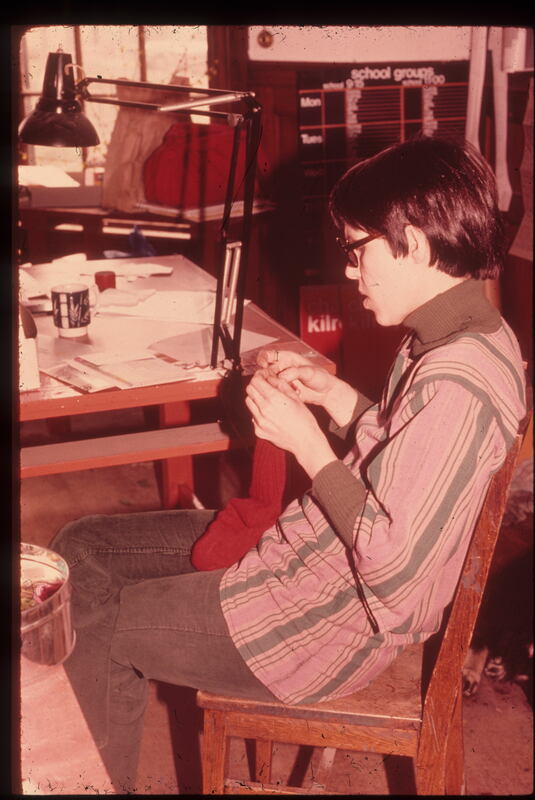 Description: In Where Did the Ideas Come From, Chapter 4 of Boston Stories, author Janet Kamien traces the intersections of personal interests, community needs, and a creative vision that inspired exhibits, programs, and other efforts. Description: Memo about changes to the BCM Accessibility Project. Description: A scanned copy of Janet Kamien's bookAlvin. 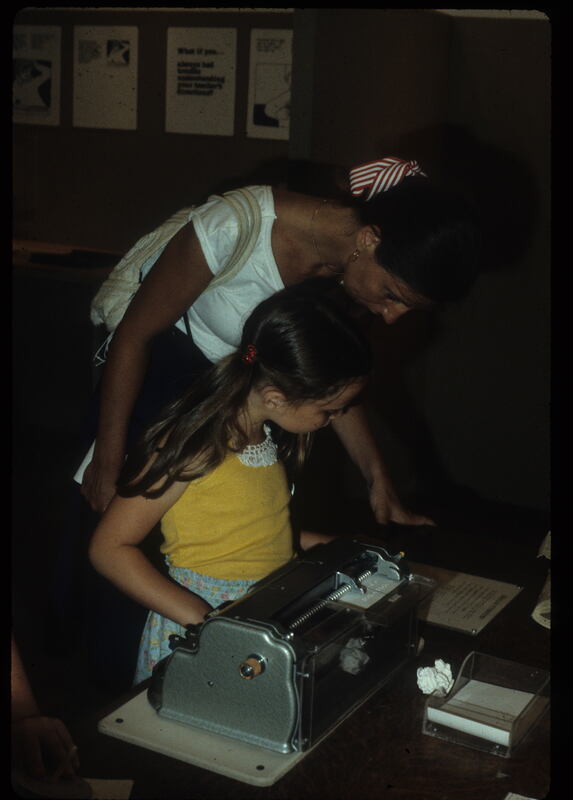 Description: Transcript of a videotaped interview with Aylette Jenness, an early employee of the Boston Children's Museum. 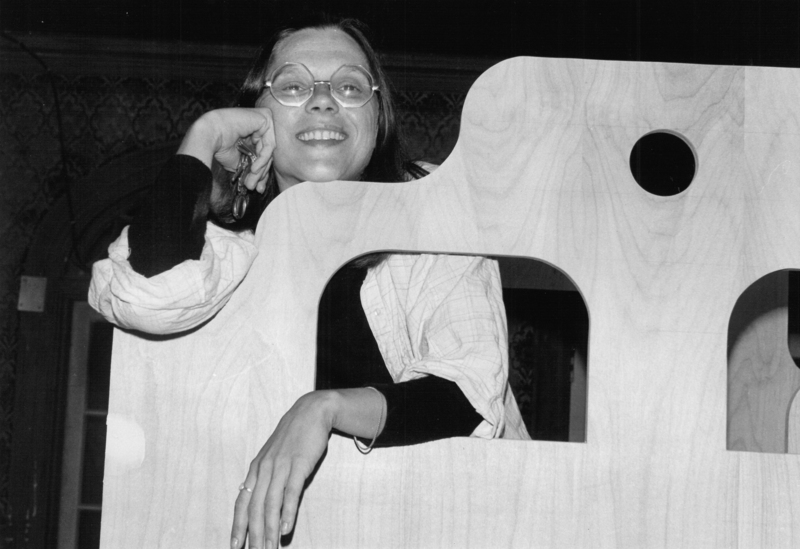 Description: Aylette Jenness discusses the origins of Talk Back Boards and exhibit participation and feedback. 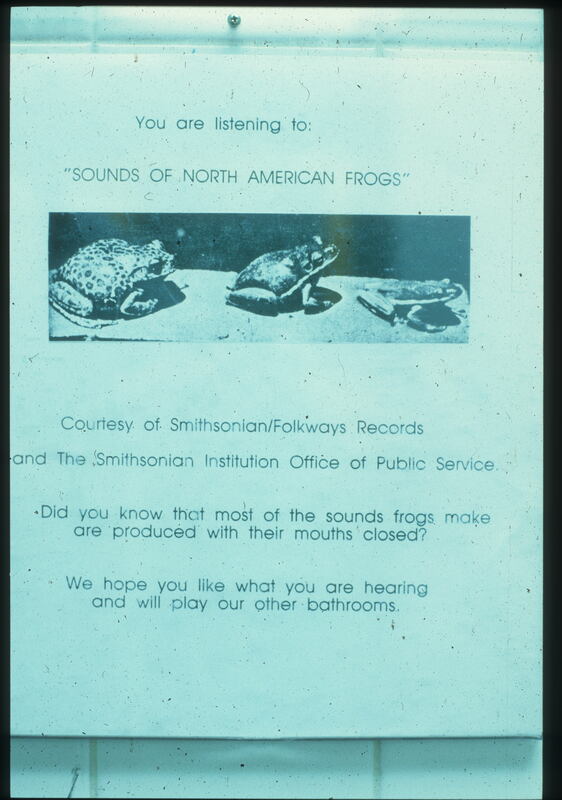 Description: A photograph of a poster hung in the bathroom used to explain the music and other recordings from the Smithsonian Folkways Collectionbeing played and encourage learning in less traditional museum spaces. 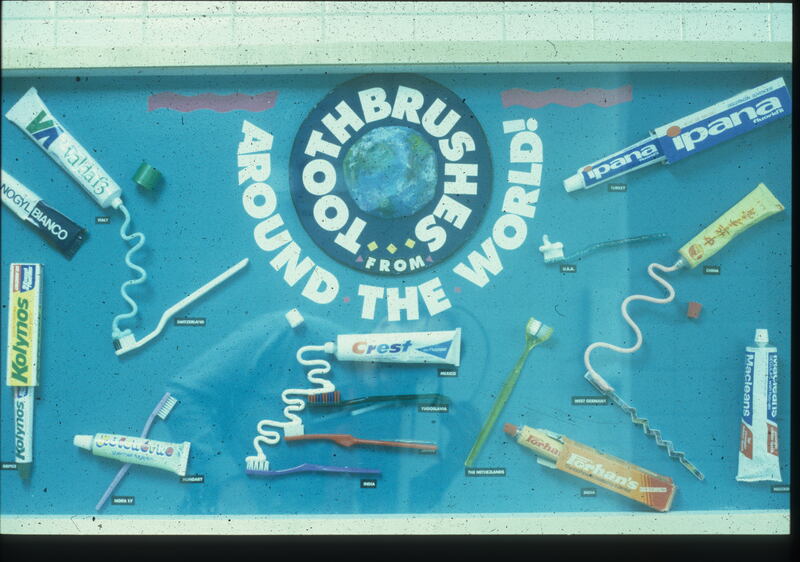 Description: A small exhibit of toothbrushes from the Toothbrushes Around The World exhibit. This exhibit was displayed in the museum bathrooms. 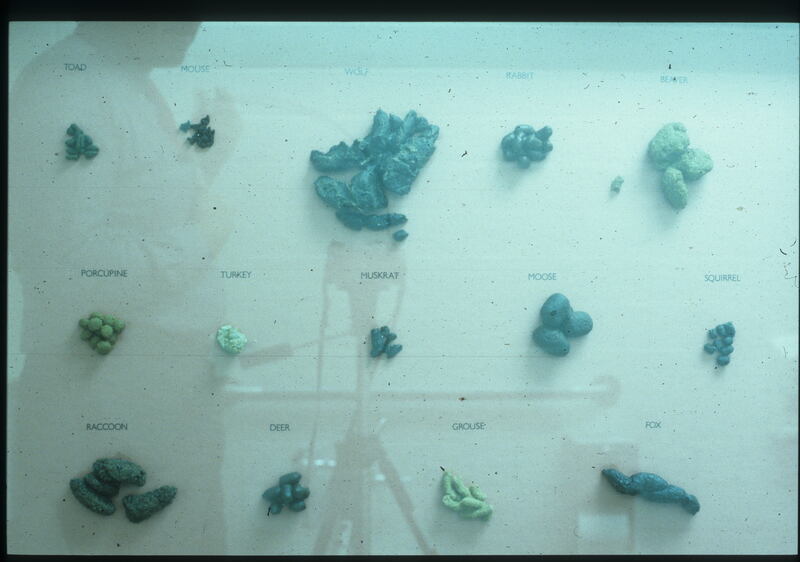 Description: Tthe animal droppings displayfrom the Bathroom exhibit in the Living Things area. Description: Discussion of how to talk to children about death and other bad news. Perhaps used as a guiding philosophy in the design of the Endings exhibit. Description: Boston Globe article about the What if I Couldn't? exhibit. Includes an interview with Janet Kamien, as well as photogrpahs of the exhibit. Description:This article was used in the Endings exhibit and tells the story of a man who reportedly wakes up during the cremation process. Description: A compilation of poems collected around the central theme of death, dying, and loss. Hand-written annotations are visible on several poems. Description: The development office at the Boston Children's Museum. Description: Informational booklet about the Mexican holiday Dia de los Muertos. Description: Article discussing students learning about handicaps, and mentioning the What if I Couldnt MATCh box. Description: Ed and Janet are photographed working in the office. Description: Elaine Gurian discusses the conception, development, and challenges of the Families exhibit. She goes on to explain how museums and exhibits can be a force for positive social change. 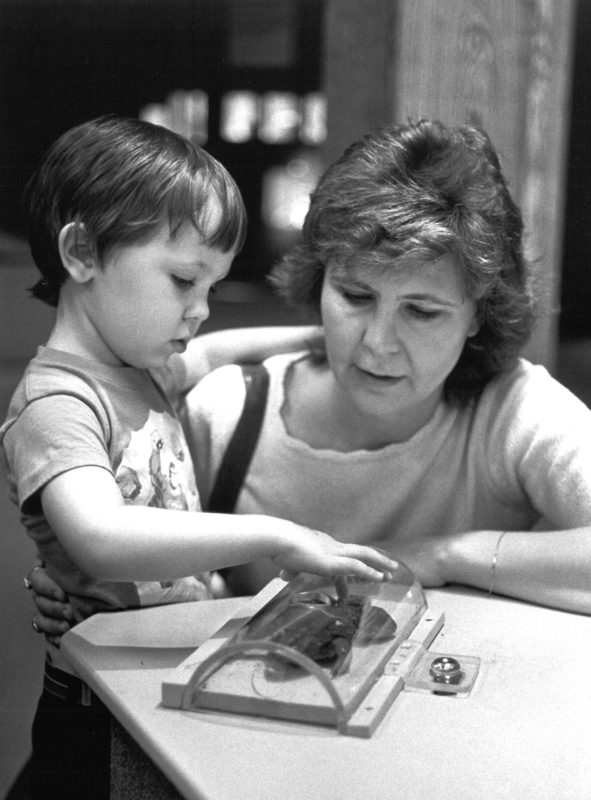 Description: Elaine Gurian explains how her personal family experiences helped her develop an idea for a special education program at the Boston Children's Museum for students who require one-to-one special accommodations. Description: Copy of grant application prepared for the Endings exhibit. 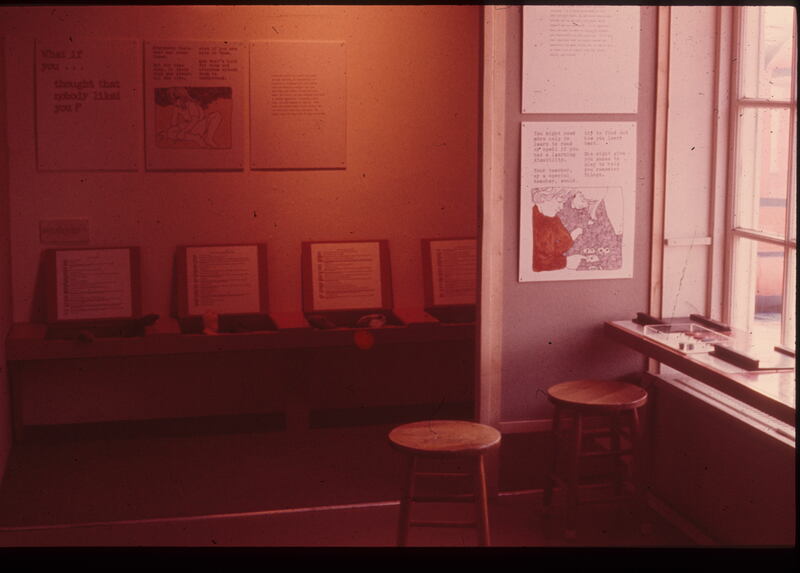 Description: Hand-written notes and formal grant application for the Endings exhibit. 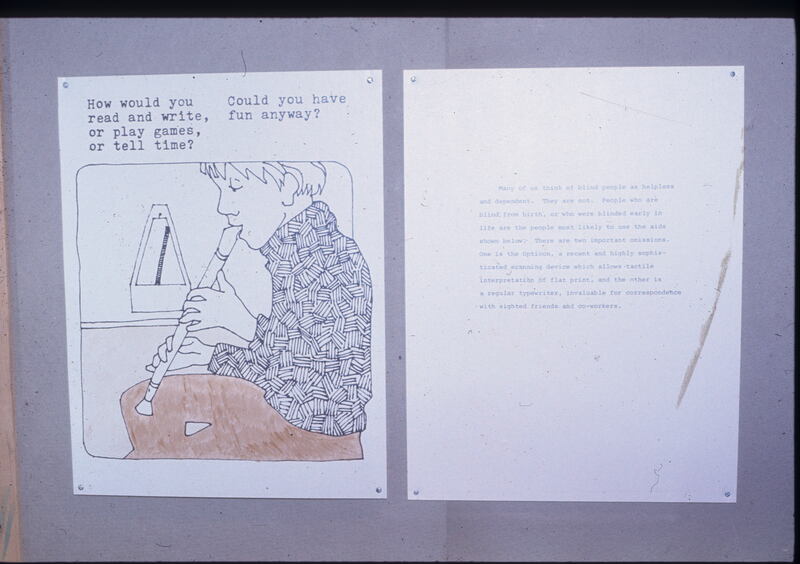 Description: Letter from Janet Kamien asking about permission to use Bloom comic strip in "Endings" exhibit. 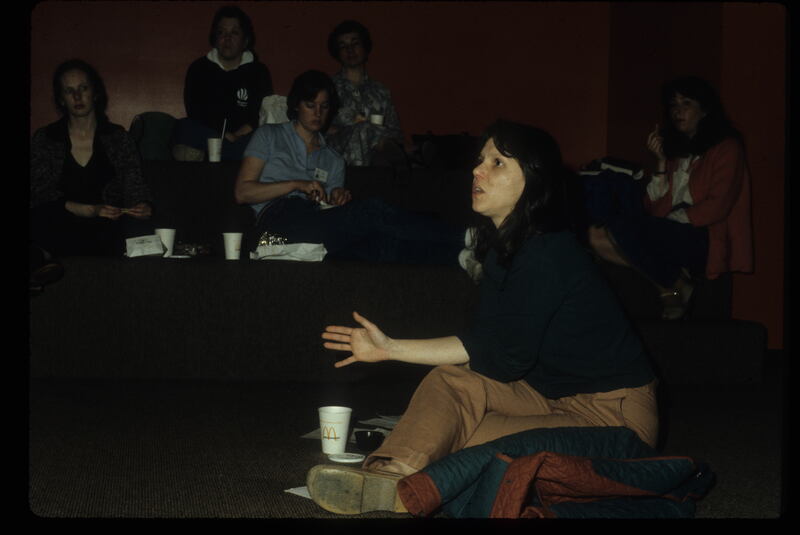 Description: A newsletter detailing the advisors included in the Endings Exhibit, which included pioneers in the field of education such as Alfie Kohn. 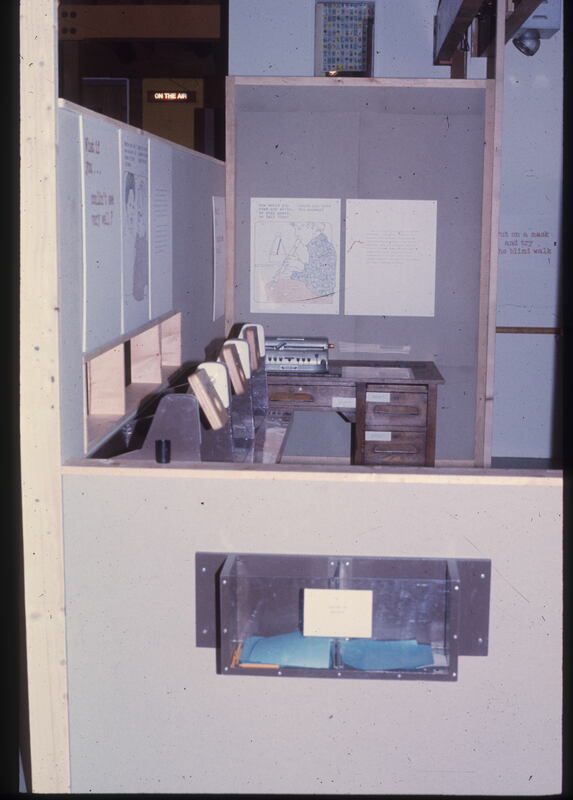 The newsletter provides a rationale for the exhibit, as well as its components and staff members. Description: Kamien reflects on the Endings exhibit 15 years after its opening and shares her thoughts regarding its controversy, development, organization, and impact. Description: Deborah Gould provides reflections, observations, and facts about the visitors' experience at the Endings exhibit based on her observations and interactions with patrons. 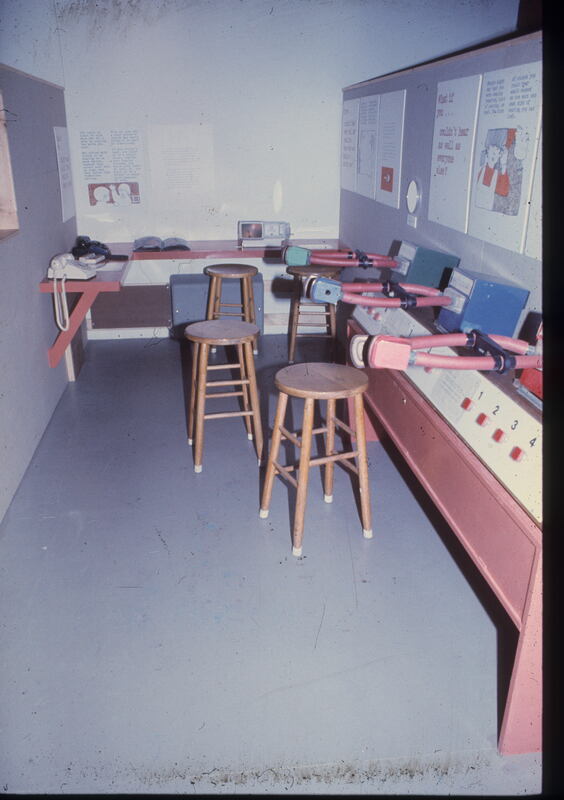 Description: A Power Point presentation that details the design and production of the Endings exhibit from 1984. Description: A sample from the talk back boards written by a child visiting the exhibit. This is an excellent example of how children participated and reflected upon their time at the museum. Description: This file includes a sample Talk Back Board from a child who visited the Endings exhibit. 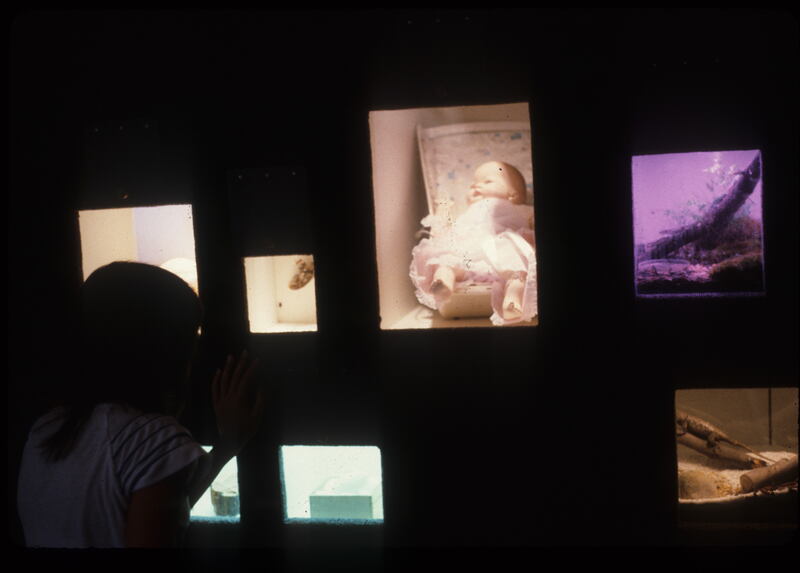 The child participates in the exhibit while reflecting on how death and birth have impacted his/her young life. Description: A series of photographs by Frank Sitemandepicting Alex and Atticus in the Endings exhibit. 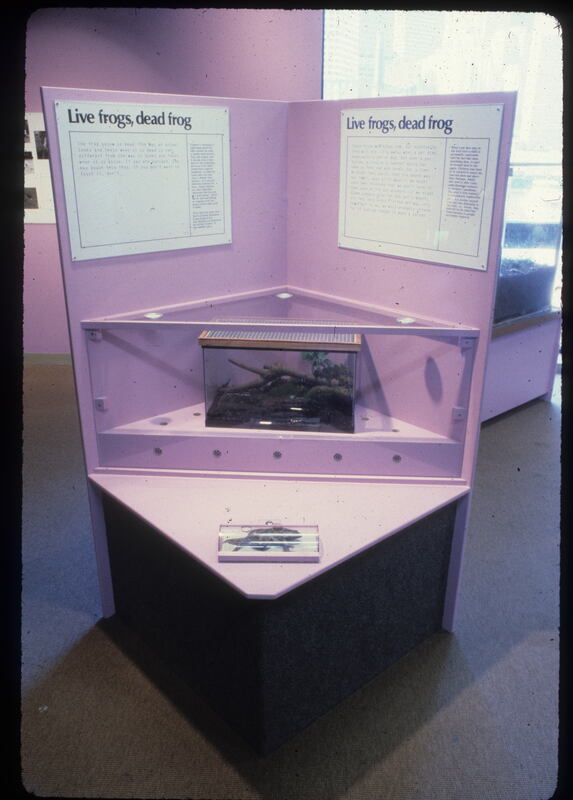 Description: Live frogs and dead frogs as part of the Endings exhibit. 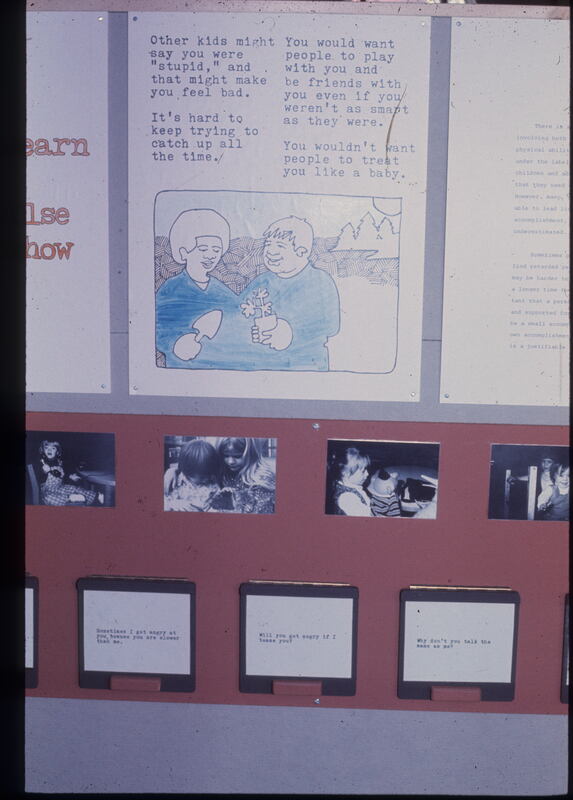 Description: Visitors read and reflect on "When Grandpa Died", a story board at the Endings exhibit. 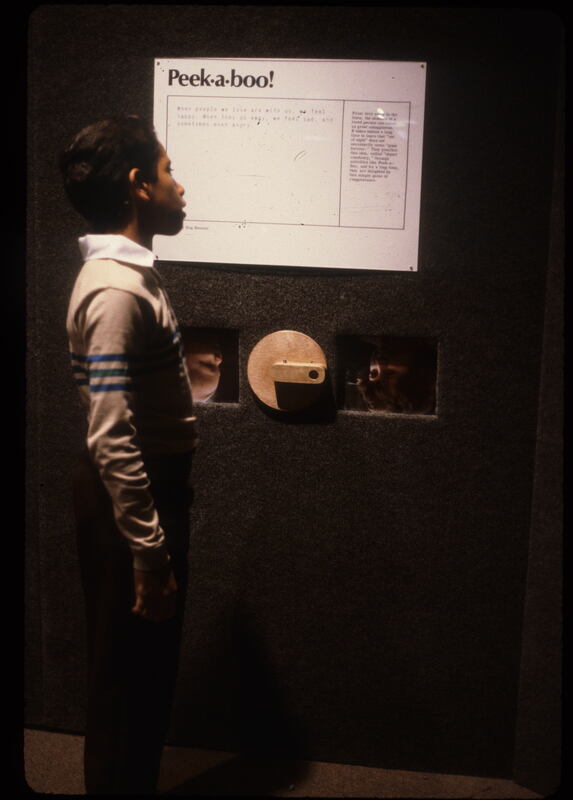 Description: A boy visits a display at the Endings exhibit. 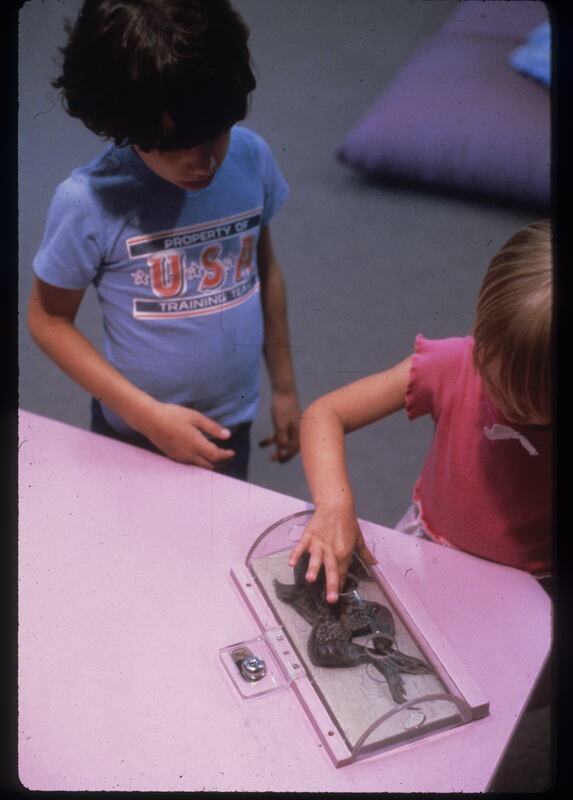 Description: Two children touch a glass case filled with a deceased frog at the Endings exhibit. 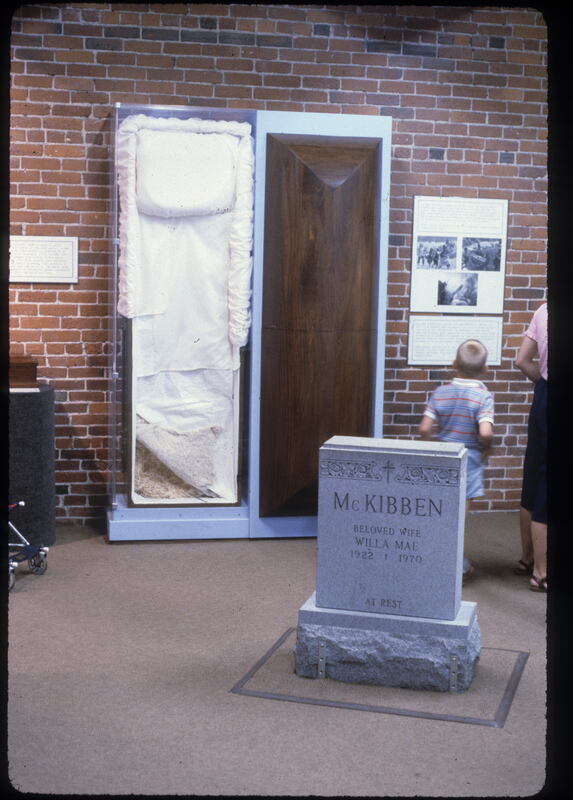 Description: The coffin and headstone featured in the Endings exhibit. 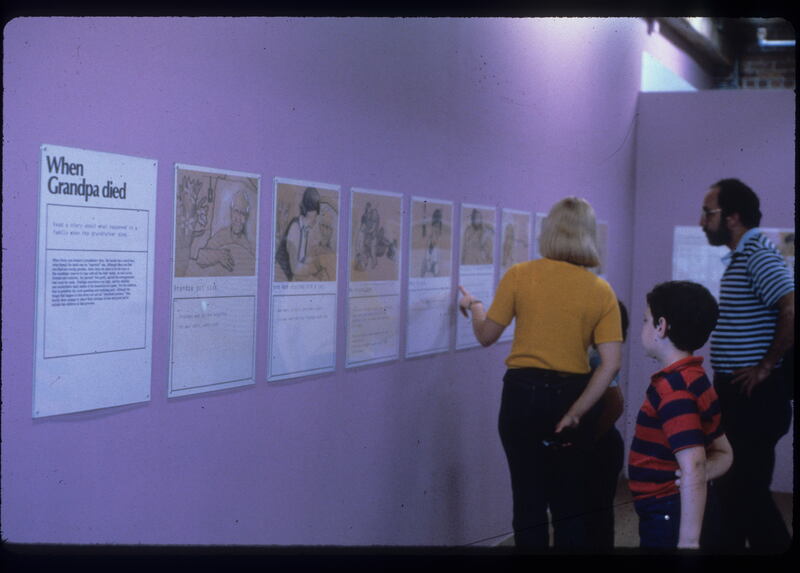 A child and a woman are also shown participating in the exhibit. Description: A full view of the Dead or Alive section of the Endings exhibit. 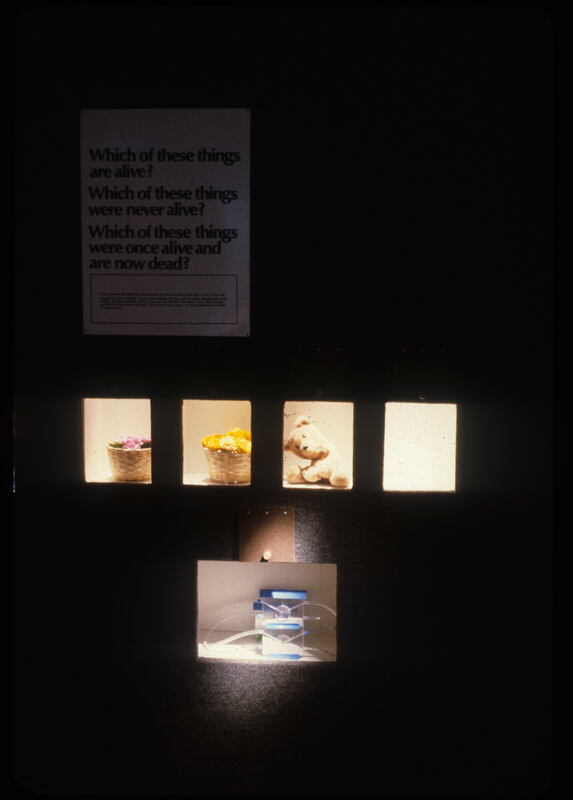 Description: A section of the Endings exhibit. 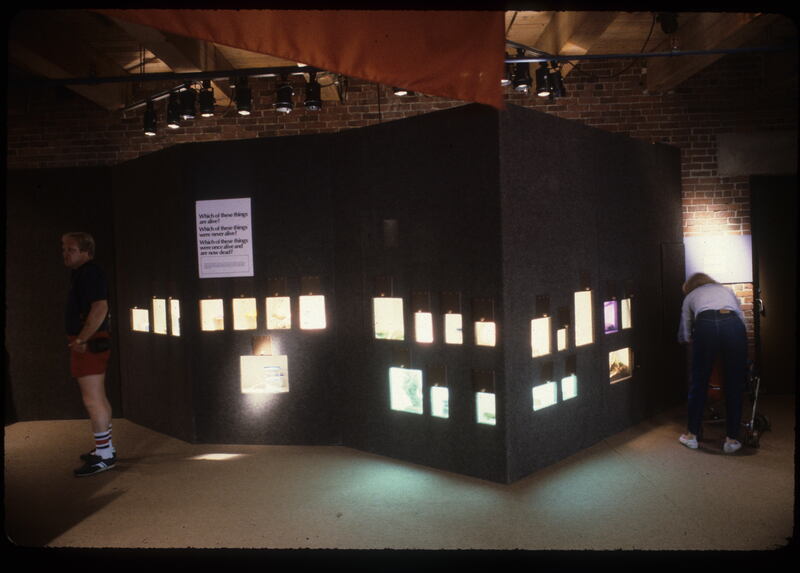 Description: A section of the Endings exhibit. Children are invited to discuss whether or not the items placed in the show boxes are dead or alive. Description: The introduction panel to the Endings exhibit. 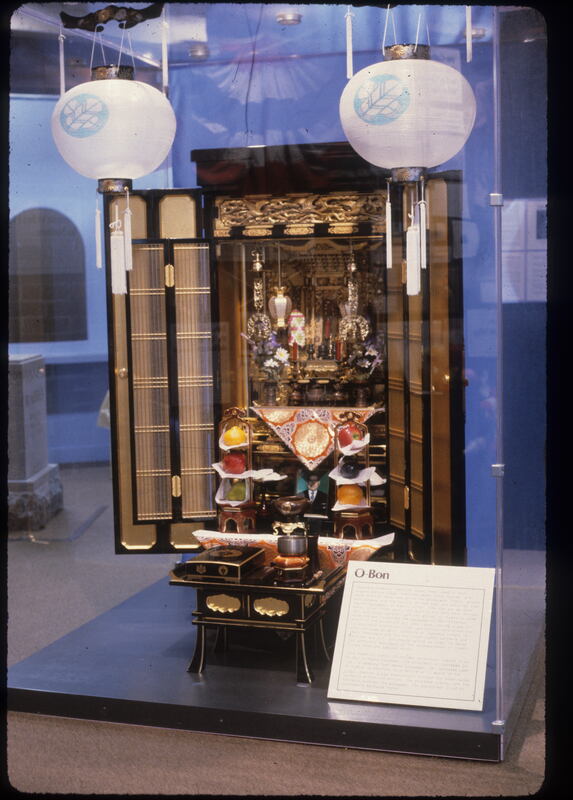 Description: An O-Bon display exhibiting the customs and practicies of Japanese Buddhists. During the Bon Festival, worshipors honor the spirits of their ancestors. Description: The Talk Back Boards at the Endings exhibit. Includes visitor feedback. 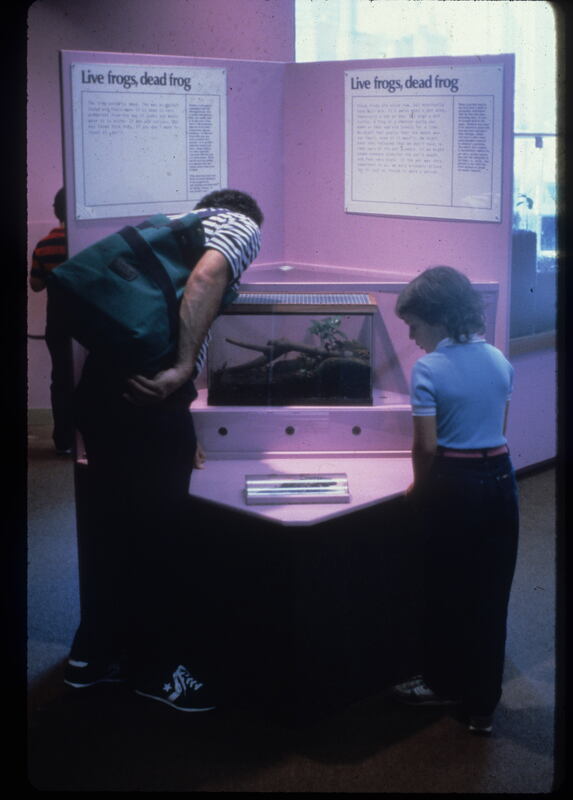 Description: An adult and child investigate the frogs at the Endings exhibit. 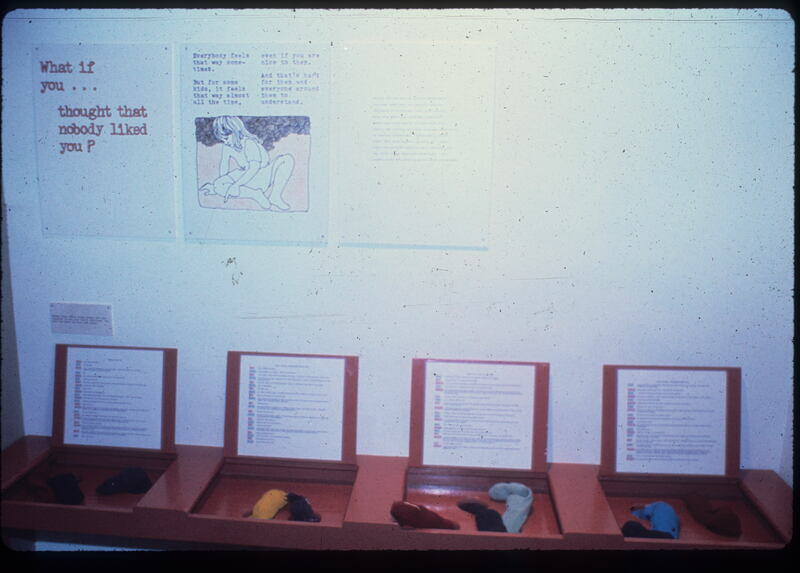 The display case as well as posters and informational text are also visible in the photograph. 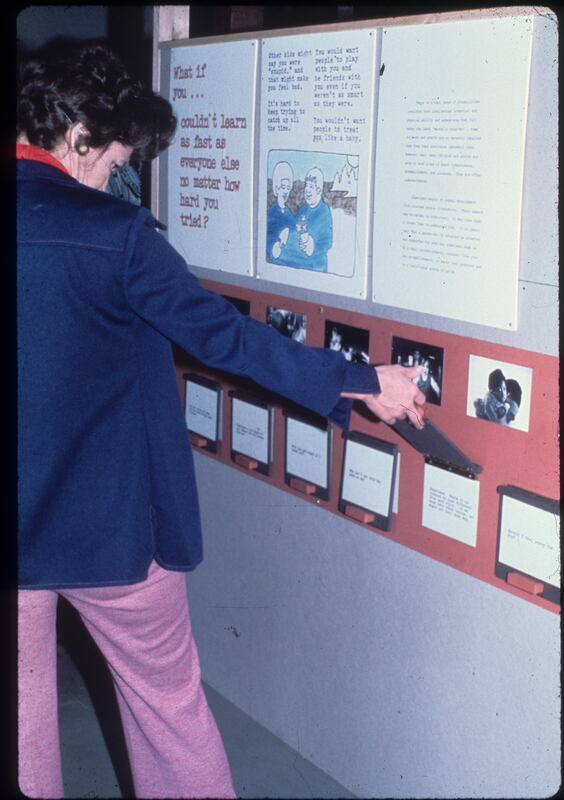 Description: Visitors reading the word wall, an educational technique used to improve vocabulary, at the Endings exhibit. 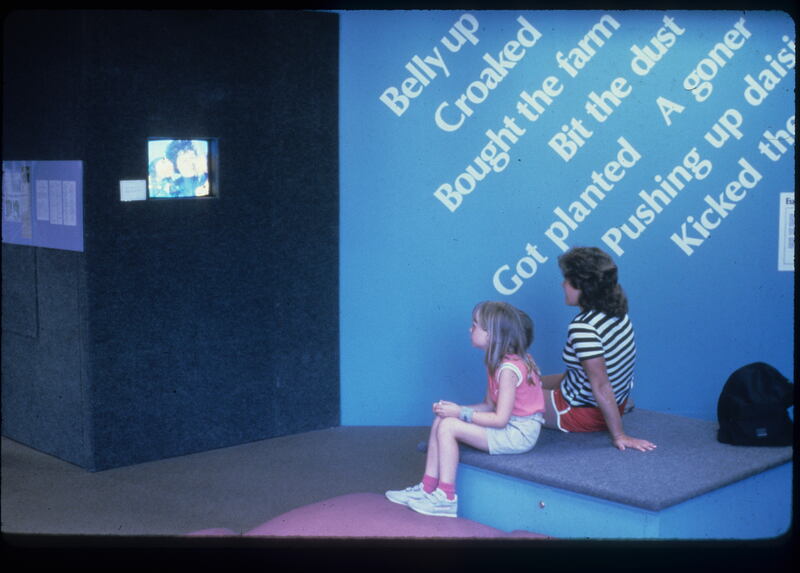 Description: Visitors sit and read the Endings word wall, a technique used to highlight key words and improve comprehension and vocabulary. 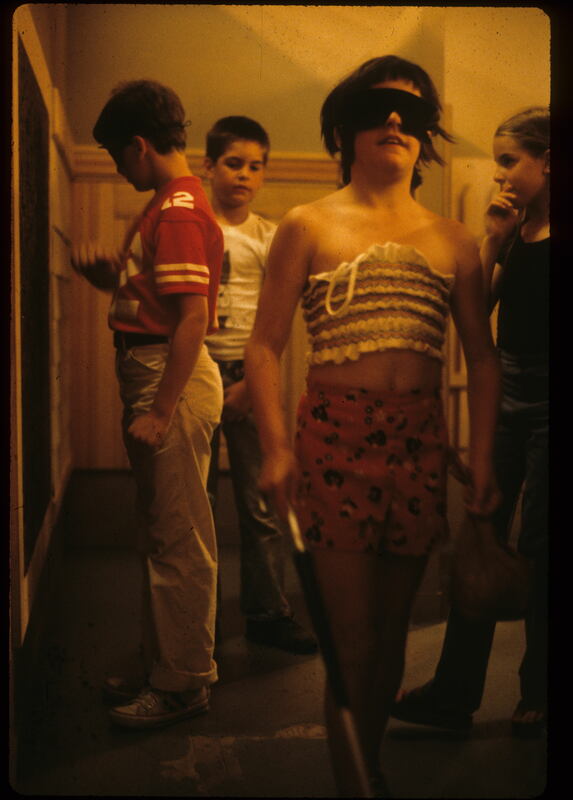 Description: A selection of photographs taken from the Endings exhibit. Includes photos of visitors, exhibit features, and exhibit participation. 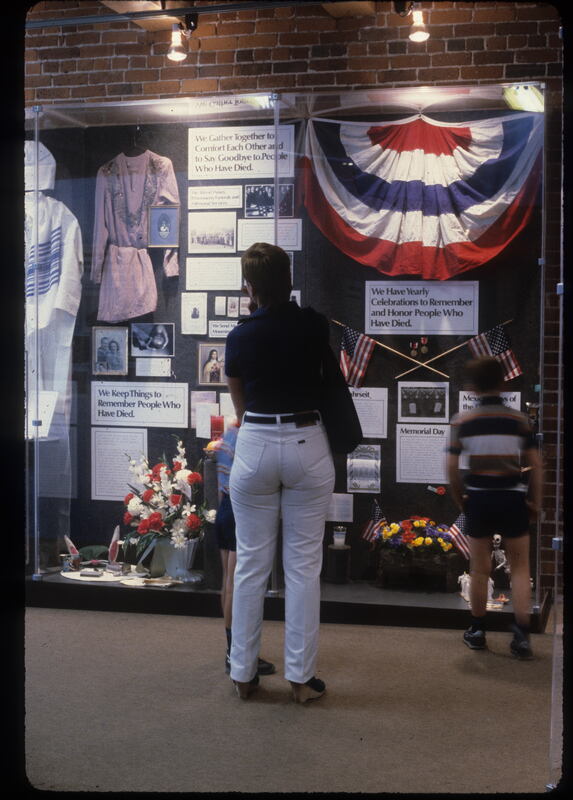 Description: A woman visits the memorial displays, which honor the lives of deceased family members, at the Endings exhibit. Description: Close up of the memorials at the Endings exhibit. Visitors can see how people around the world honor people who have died. Description: Review in The New York Times about Endings exhibit. 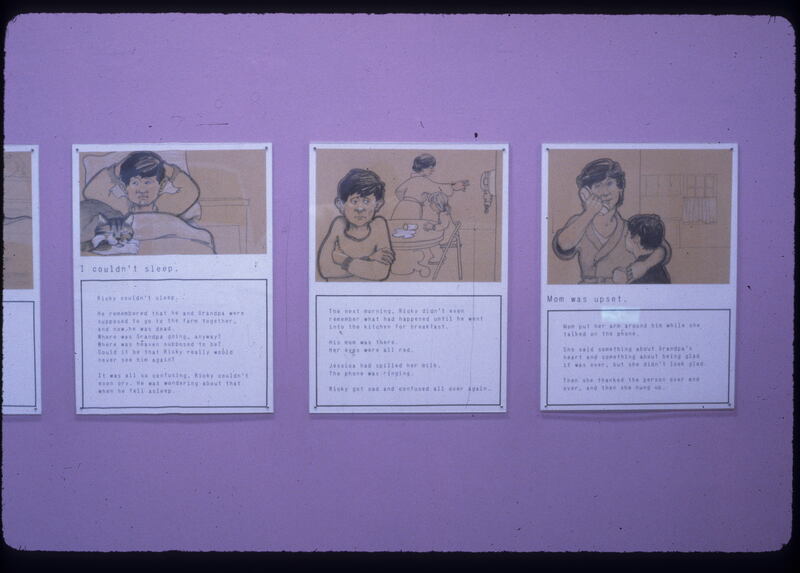 Description: A photograph of a story board featured in the Endings exhibit. 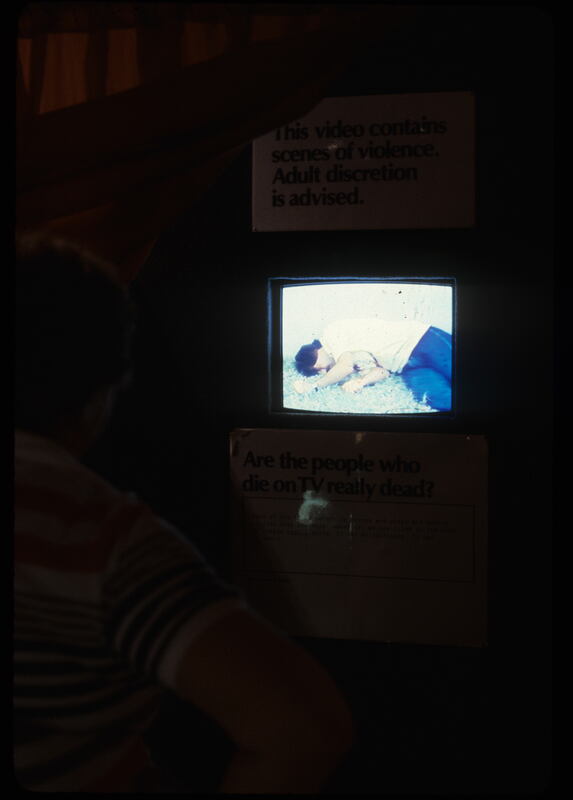 Description: A photograph of a television and recording used during the Endings exhibit. 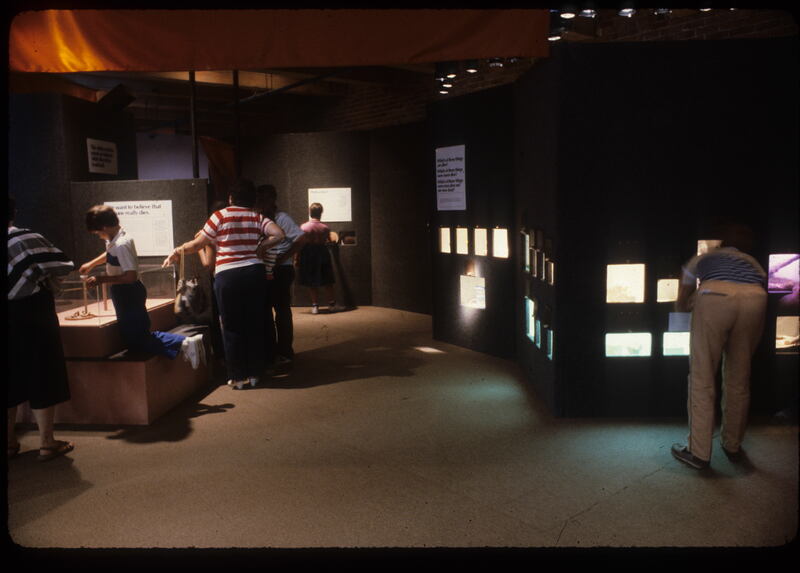 Description: Visitors observe the Dead or Alive section of the Endings exhibit. 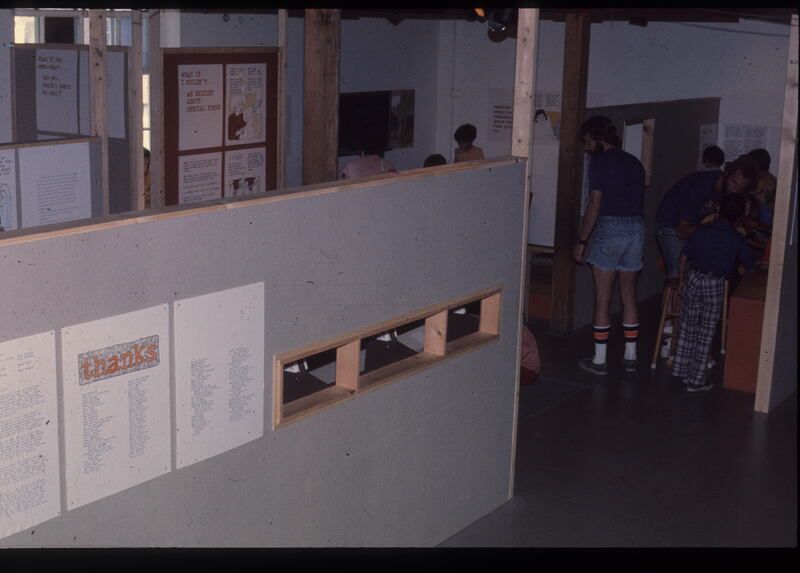 Description: A visitor reads at the peek-a-boo section of the Endings exhibit. 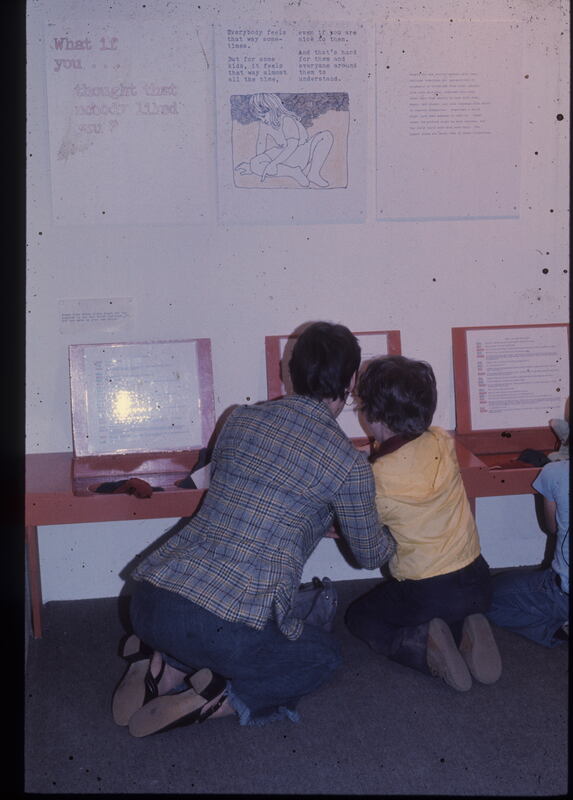 Description: A woman and young boy photographed here explore the hands-on aspects of the Endings exhibit. Description: Article describing the Endings exhibit, published by the Panama City News Herald. 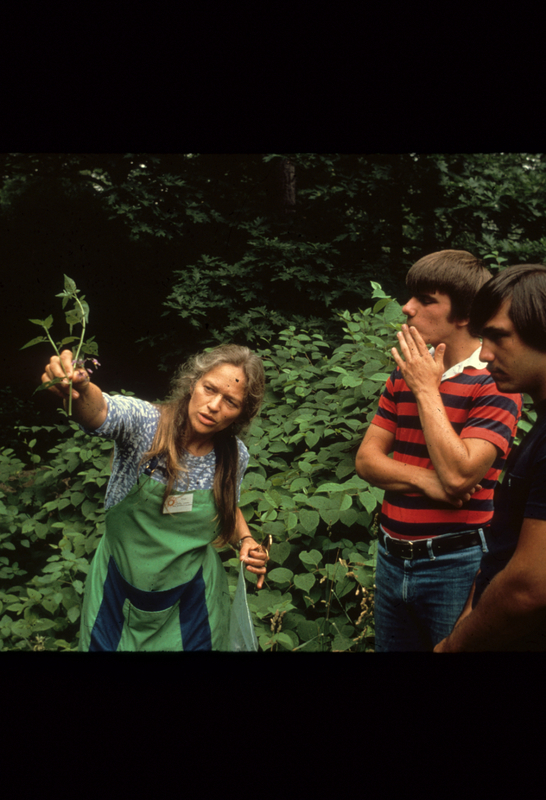 Description: A staff member and two visitors examine a plant. 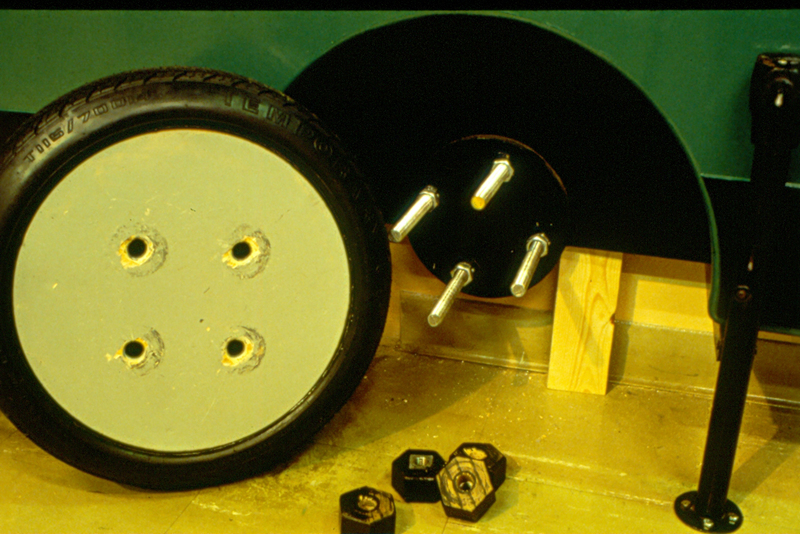 Description: Article describing the BCM traveling exhibit, What if You Couldnt...? Description: Newspaper article in the Boston Globe, detailing the Endings exhibit and its contents. Description: Discussion about exposing children to violence and the effects on them as they grow up. Description: The selection features scanned pages from the book as well as the table of contents, and workbook pages compelted by children visiting the museum. Description: Handouts and forms related to the Family Support Center (Judge Baker Guidance Center) and the Good Grief Program, which aimed to provide support to families and children struggling with loss and grief. 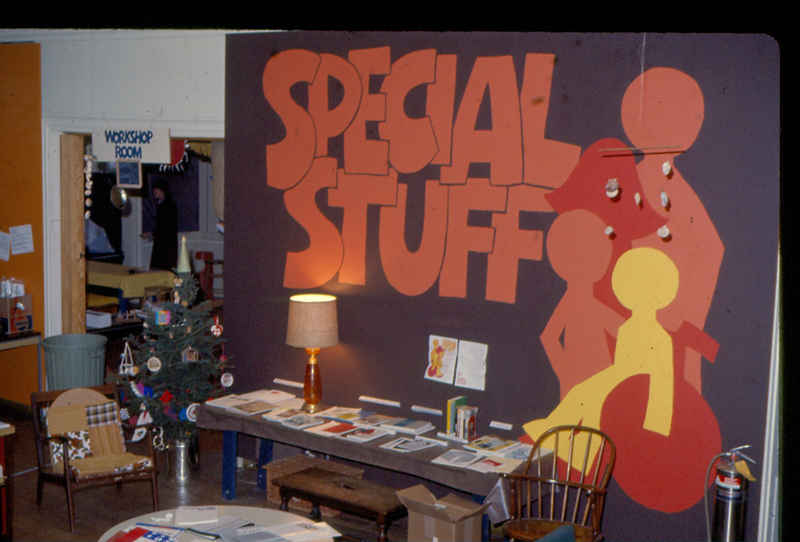 Description: Flyer detailing several events and programs focusing on special needs that took place at the Boston Children's Museum. 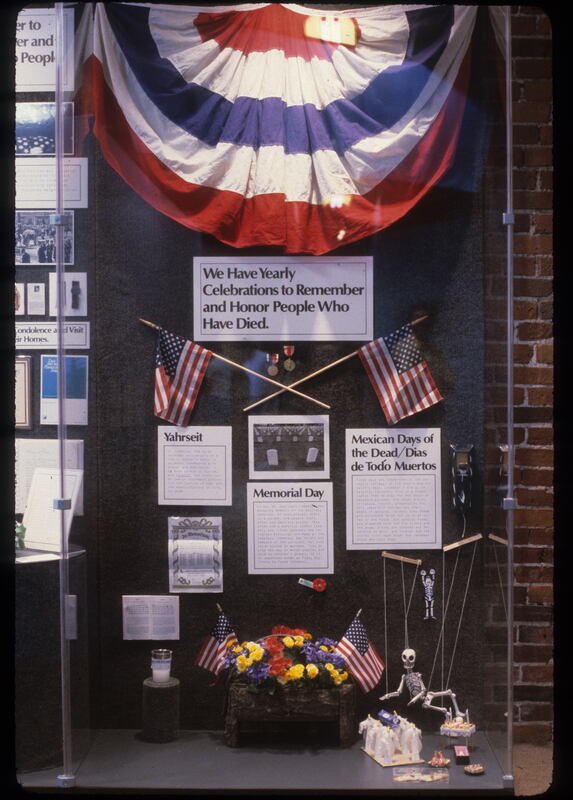 Description: Part of a display used at the Fort Point Garage exhibit. 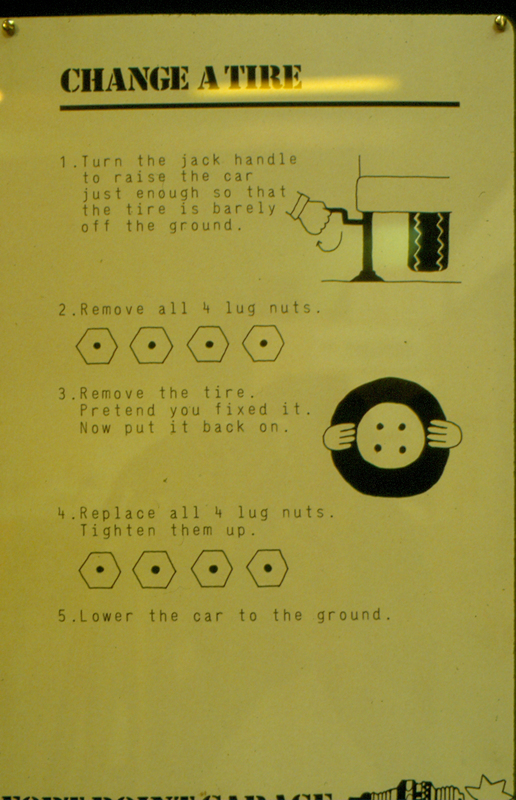 The poster explains how to change a flat tire. Description: Car parts featured in the Fort Point Garage exhibit. 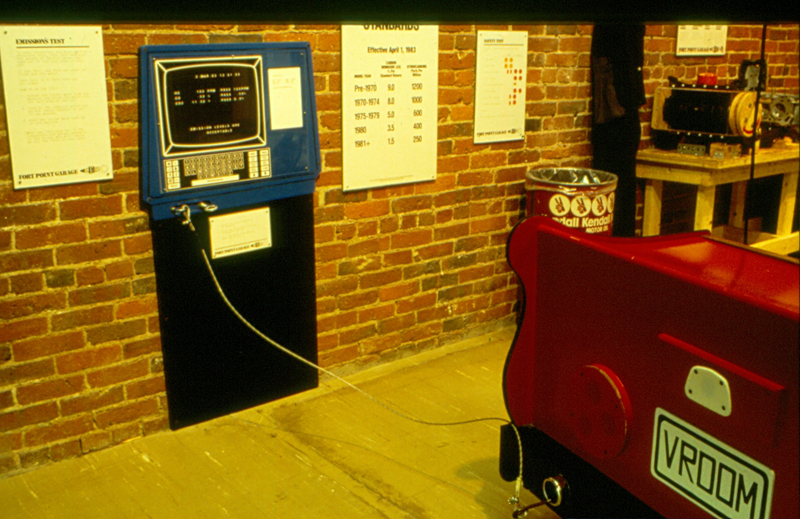 Description: The emissions test section of the Fort Point Garage exhibit, which was designed and produced by the Design and Production team at BCM. 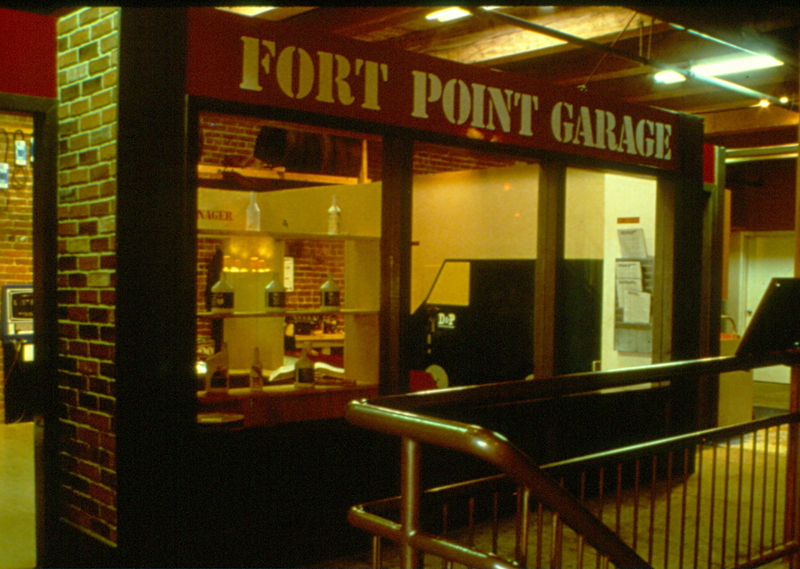 Description: The Fort Point Garage exhibit designed and built by the Design and Production team at BCM. 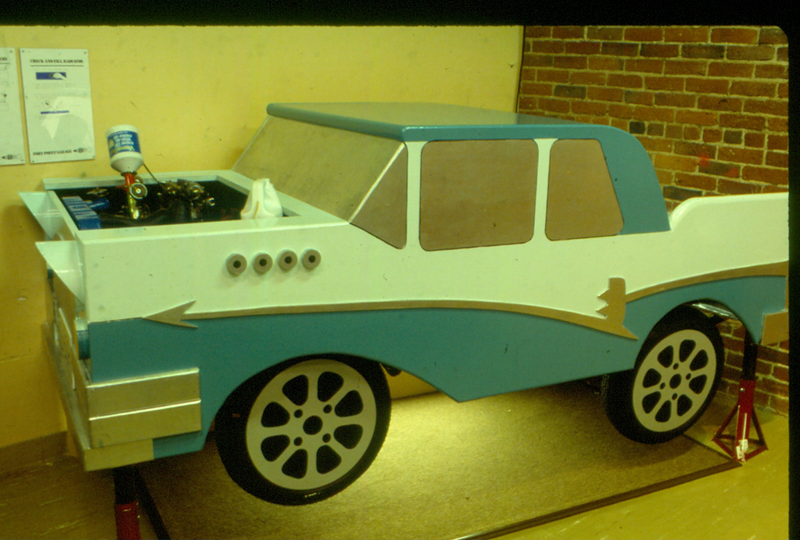 Description: A model car in the middle of mechanic work in the Fort Point Garage Exhibit. 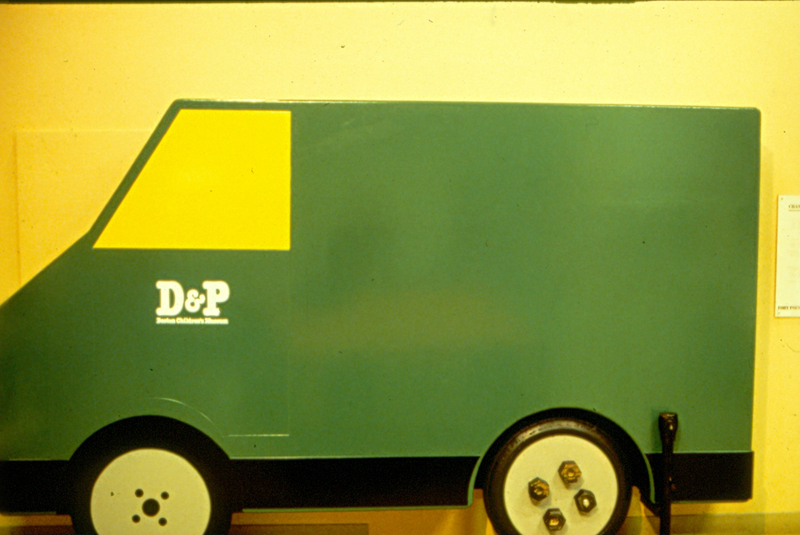 Description: A model green truck used at the Fort Point Garage exhibit. Description: An article from the Boston Globe about funeral directors in training. Description: Membership card for the Greater Boston Association for Retarded Citizens, addressed to Janet Kamien. Creator(s): Greater Boston Association for Retarded Citizens, Inc. Description: An article titled Going Out In Style, which details the self-designed coffin used in a Chicago man's funeral. Description: A scanned copy of Deborah Gould's Children's book, Grandpa's Slide Show. Description: This annotated map provides information on a modern graveyard in Boston, as well as information about ancient burial practices. Includes locations, facts, and histories about each place. It was one of several guides fromthe museum's Detours project. Description: Children and parents explore the different experience buying, selling, and browsing at the Grocery Store exhibit. 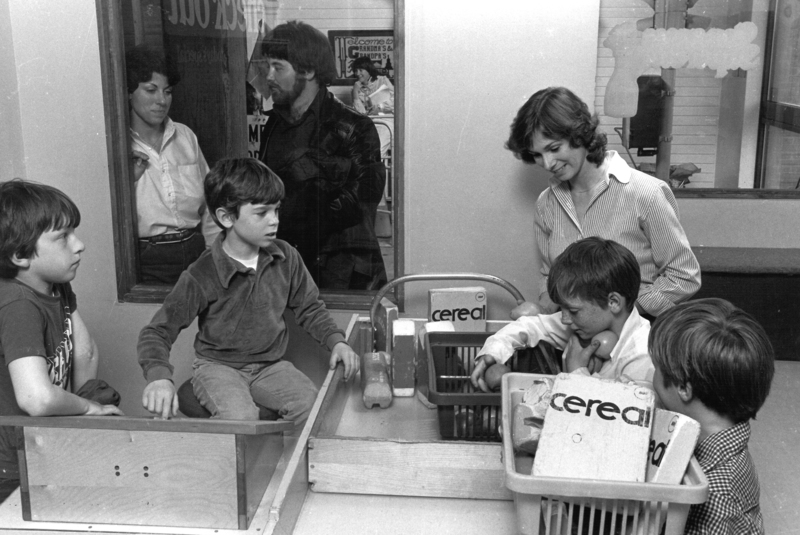 Description: Two children playing and learning at the Grocery Store exhibit. Description: Newspaper article that discusses children coping with the stress of death. Description: Two girls play and learn through role play at the Hospital exhibit. Description: Includes an essay by Janet Kamien titled How Do Special Needs Alter Arts Education Programs Outside of the Regular Classroom Setting: An Example From the Children's Museum in Boston. The scanned essay also includes hand-written notes at the end of the document. Description: Janet Kamien and her leadership in raising awareness of individuals with special needs. 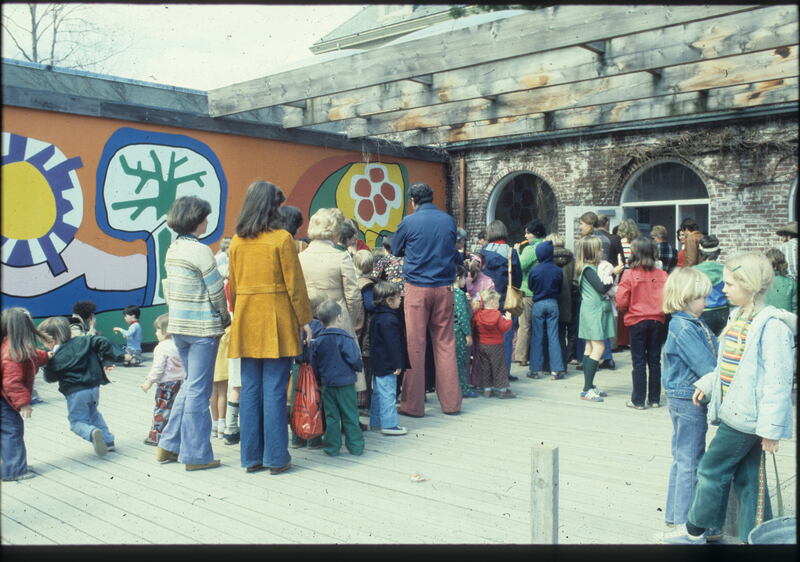 Description: Children and adults wait in line to enter the Boston Children's Museum. Description: The guide is intended to assist organizations and institutions in evaluating their programming and accessibility for adults and children with disabilities. Description: Publication from the Boston Children's Museum, featuring excerpts from letters regarding "Is there Life After 504? A Guide to Building and Program Accessibility." Description: Certificate naming Janet Kamien an honorary citizen of Indianapolis in recognition of her outstanding contributions (to what is not specified). 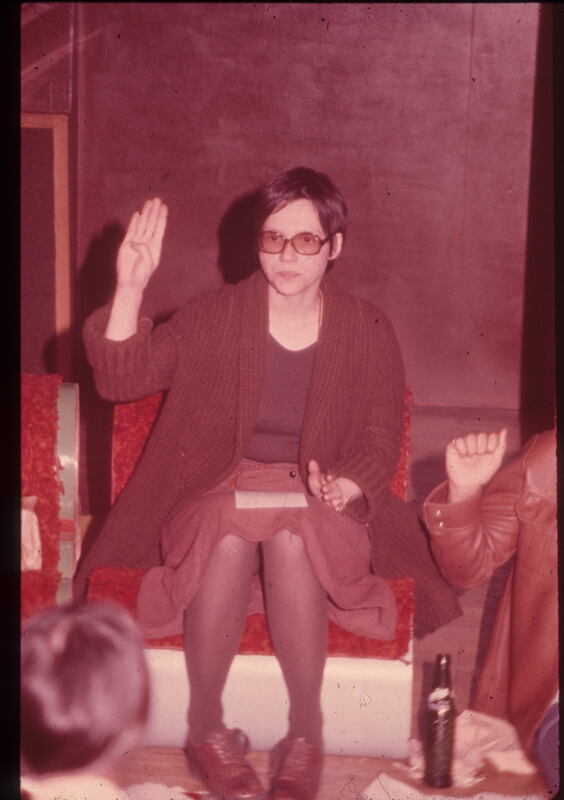 Description: Janet Kamien is pictured at one of the museum's exhibits. Description: A scanned copy of Janet Kamien's 1983 resume. 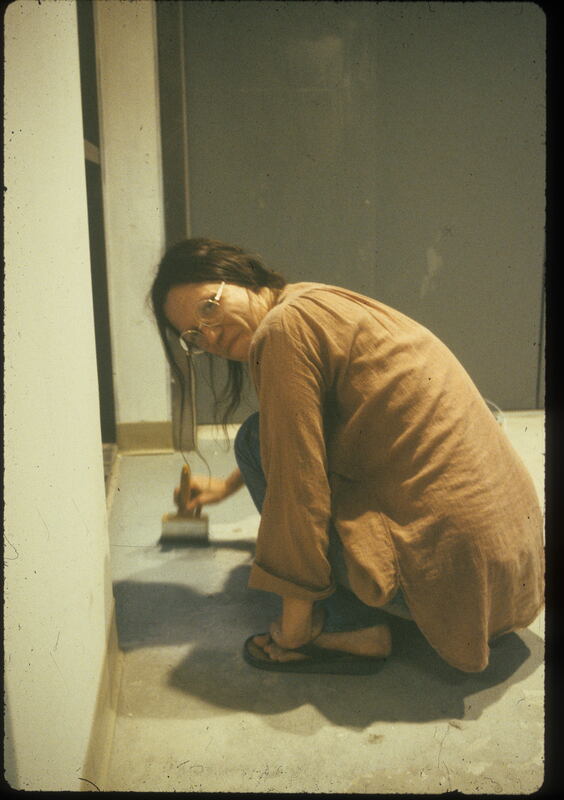 Description: A photograph of Janet Kamien helping to construct an exhibit by painting the floor. Description: Janet Kamien signs the letter 'b' at the What if? exhibit. Description: Janet Kamien works at her desk. Description: In a short video clip, Janet Kamien discusses some of the challenges in choosing artifacts for the Endings death and loss exhibit. Description: Janet Kamien discusses the impact of special education laws on the Children's museum, and how the museum designed exhibits to meet the needs of children with special needs. Description: Janet Kamien shares her insights on programming for children with special needs. 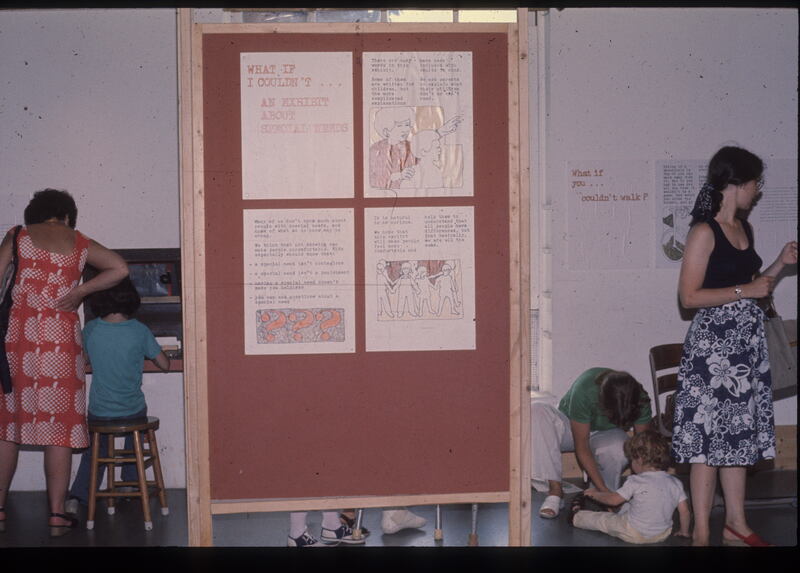 Description: Janet Kamien is photographed here working with museum staff. Description: Tthe behind the scenes efforts of the museum. 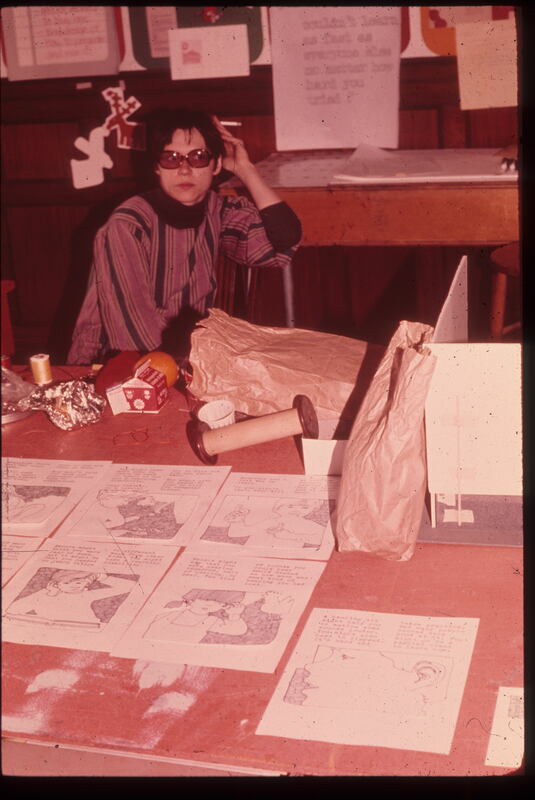 Janet Kamien is pictured with a series of story boards as they are being made. Description: Letter to Janet about pictures of appearance on Nightline. Description: Different experiences about losing a parent. Description: Letter from the Massachusetts Association for Retarded Citizens informing Janet Kamien that she was the recipient of the 1983 Distinguished Citizens Award. 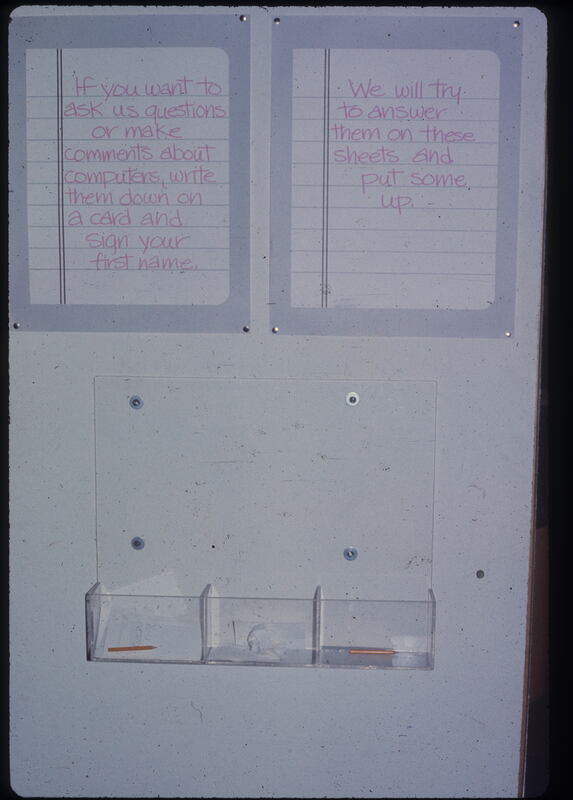 Description: Example of a visitor's take-home activity card from the exhibit ME! Description: A scanned resource booklet produced by the National Center for Death Education. Includes a rational for death education, as well as a list of resources for many different kinds of institutions that aim to provide death education. Description: A report on thedemographics and opinions of museum visitors interviewedto evaluate its programming and exhibits. Includes research methods and analysis of results. Creator(s): Jeff Hayward, Director, People, Places & Design Research. 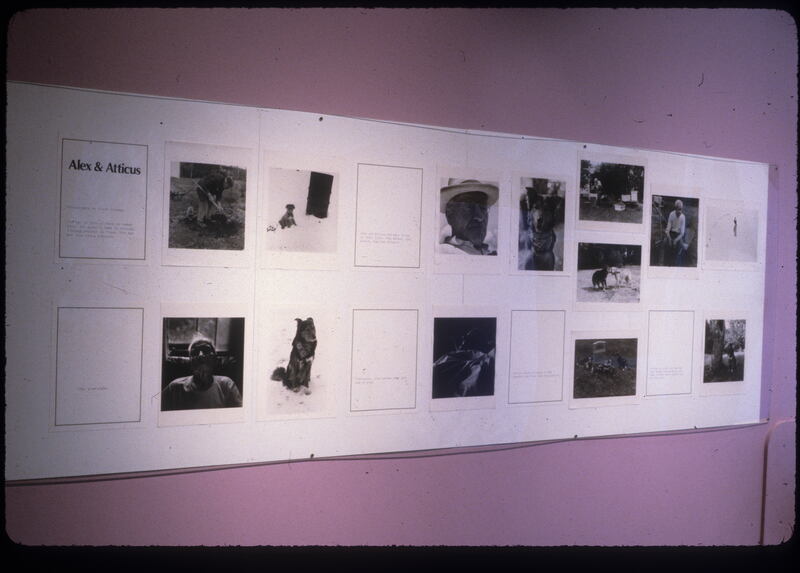 Description: A museum document that includes possible programs and proposal topics for the 1986 year. Includes insights on the Families and Endings exhibits, as well as others. Description: Postcard inviting Janet Kamien to a field trip at Stony Brook Valley. Description: Provides notes and a review of the Atlanta convention in which stakeholders from the Boston Children's Hosptial and other university specialists met and discussed the needs and options for the Children's hospital exhibit. Description: A scanned version of the legal agreement between Scribne's Publishing and The Children's Museum to publish the work What If I Couldn't?. 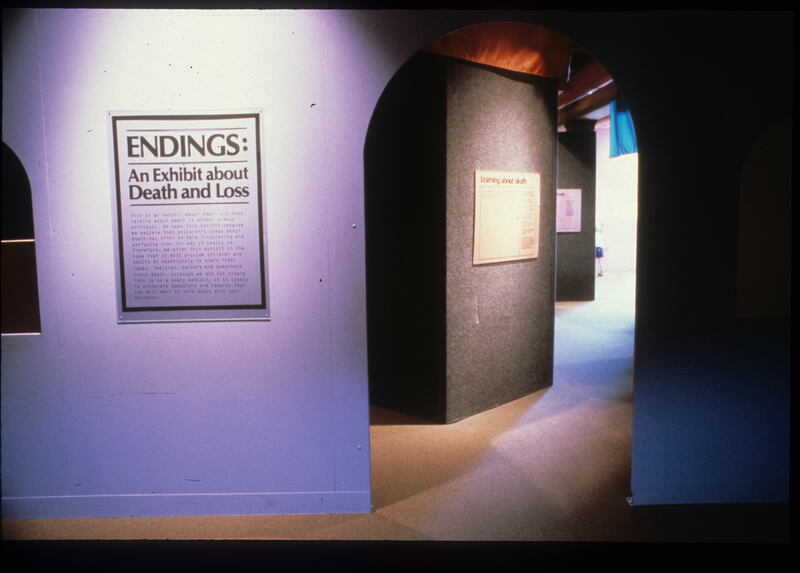 Description: Seeing Death as a Part of Life includes an interview with Janet Kamien on the development of the Endings exhibit. 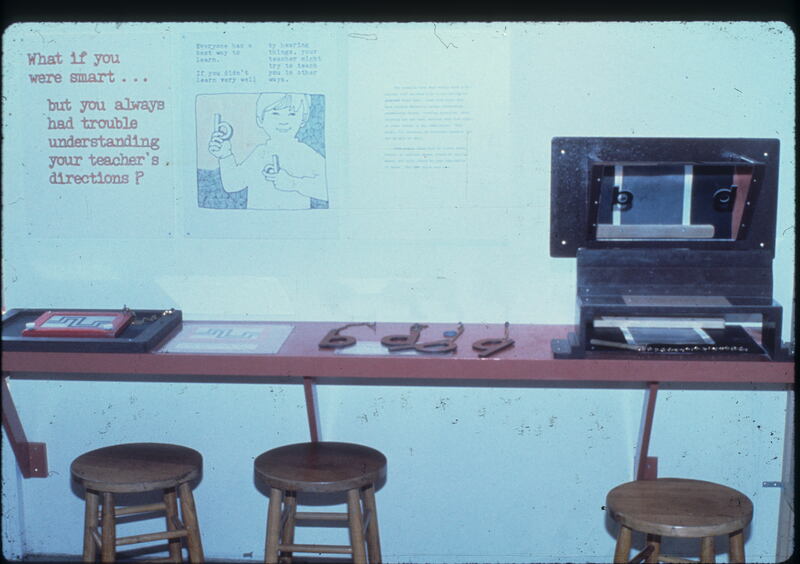 Description: A scanned copy of a 1984 Boston Globe article on the Endings exhibit. Includes an interview with Janet Kamien. Description: Brief description of the "What if I Couldnt" Traveling Exhibits, including costs. Description: Scanned journal from the Moral Education Forum's 10th anniversary issue: The Sociomoral Dimension of Museum Design. Includes an essay by Janet Kamien titled Endings: An Exhibit on Death and Loss. 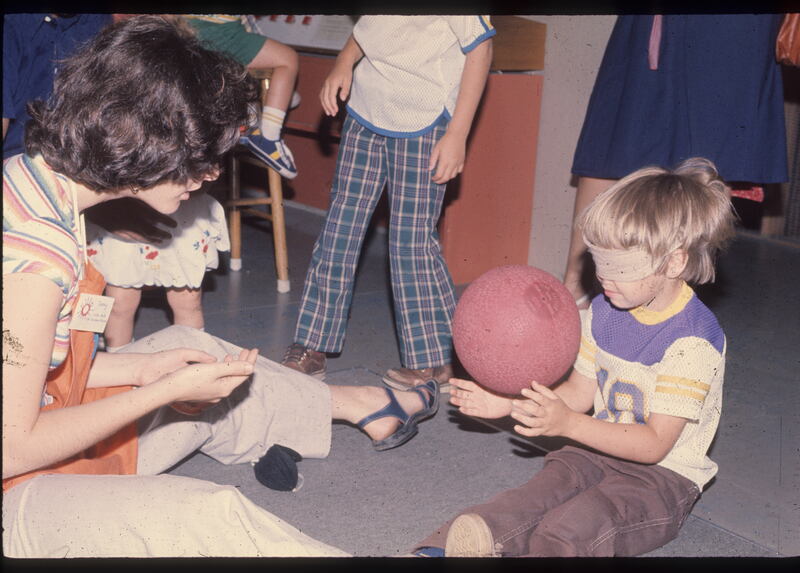 Description: This document outlines the programming available for children with special needs at BCM in 1979. It provides examples of programming, teacher and parent involvement, and future plans for programming. Description: A personal diary written by amuseum interpreter reflecting on her experiences in the Special Needs Wednesday program. Description: A photograph of the Special Stuff Workshop. Description: Flyer informing the community and members that the Boston Children's Museum has ensured that it is accessible to members of the special needs community. 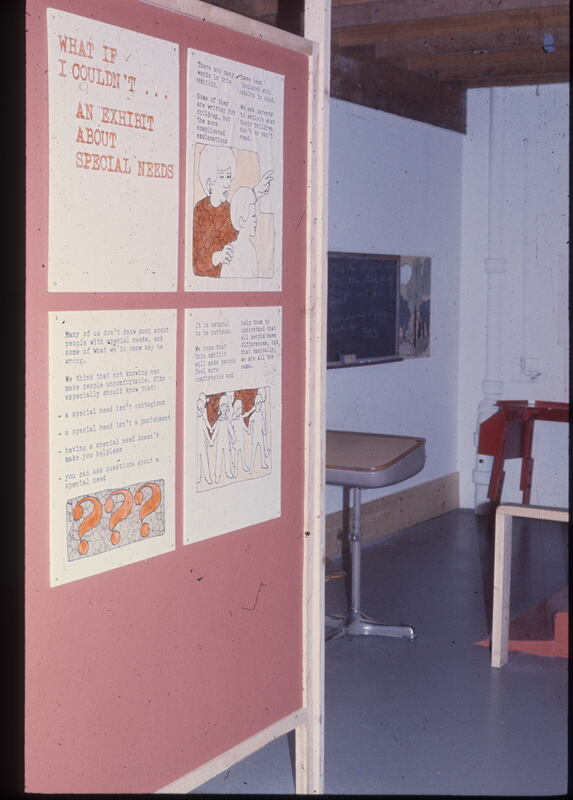 Description: A handout advertising the museum's accessibility for children and adults with special needs. The handout invites visitors to provide feedback for the museum as it works towards making the museum as accessible as possible. 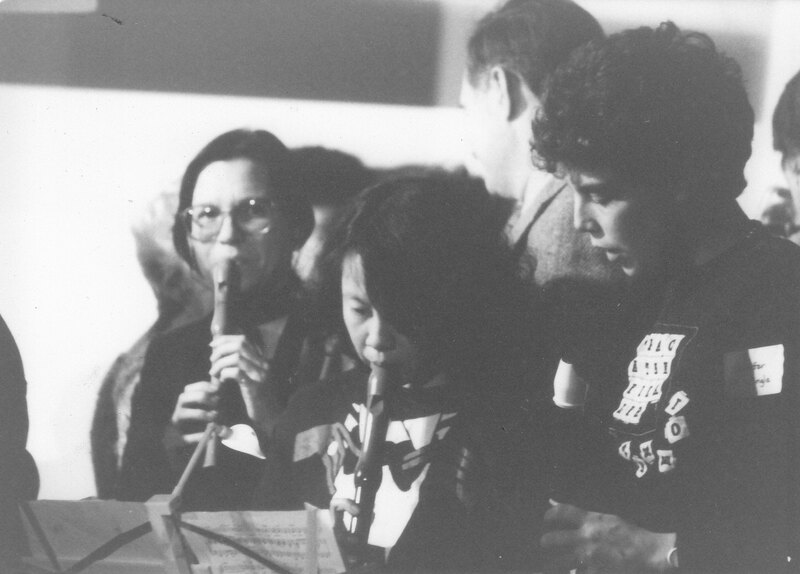 Description: A photograph of staff members playing musical instruments. 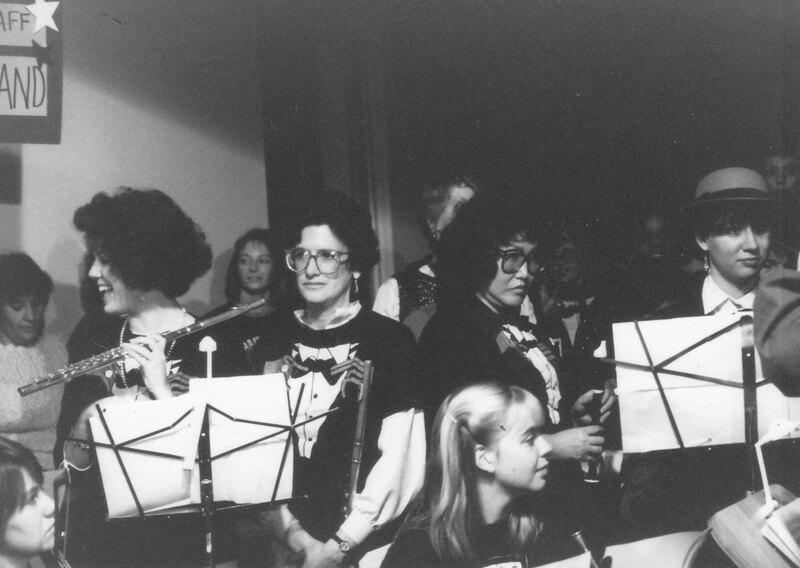 Description: Staff members participate in a musical performance. 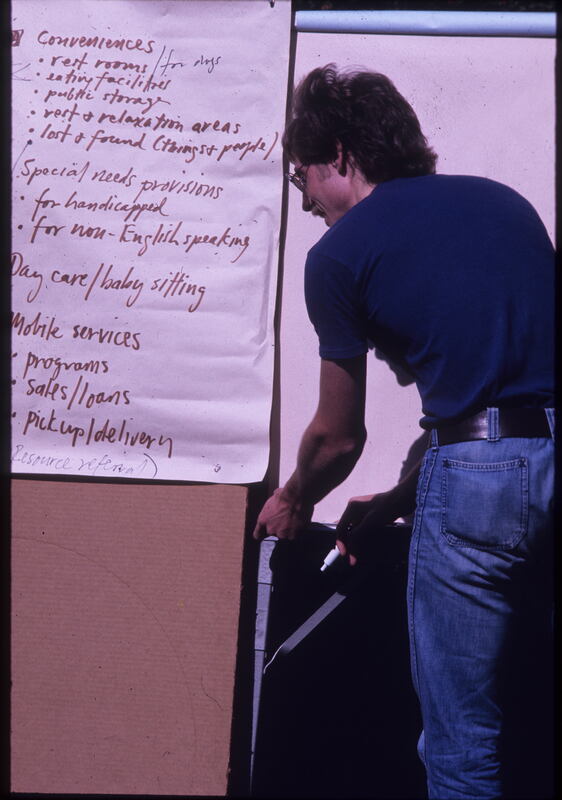 Description: Staff notes from June 22, 1983. Includes a profile of Janet Kamien's experiences with the museum as she prepares to leave the museum and move to Florida. Description: An edited version of Talking Back by Janet Kamien. 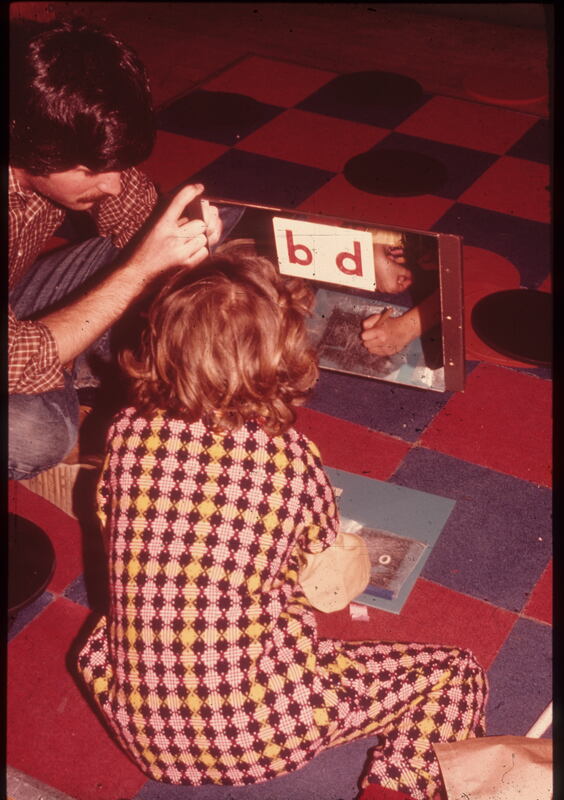 This essay reflects on the development of direct visitor feedback at the Boston Children's Museum. Includes edits and annotations. Archive Title: Talking to Children about Death by Janet Kamien and Martin M. Norman, Ph.D. Description: An essay written by Janet Kamien and Dr. Martin M. Norman titled Talking to Children about Death. Explains how children process death and loss, and provides additional reading materials for further inquiry. Creator(s): Kamien, Janet; Norman, Martin M.
Description: Mailable membership enrollment form that discusses benefits of membership at the Children's Museum, as well as rates and information about tax deductions. Description: Panel of "The Family Circus" comic strip dealing with death. 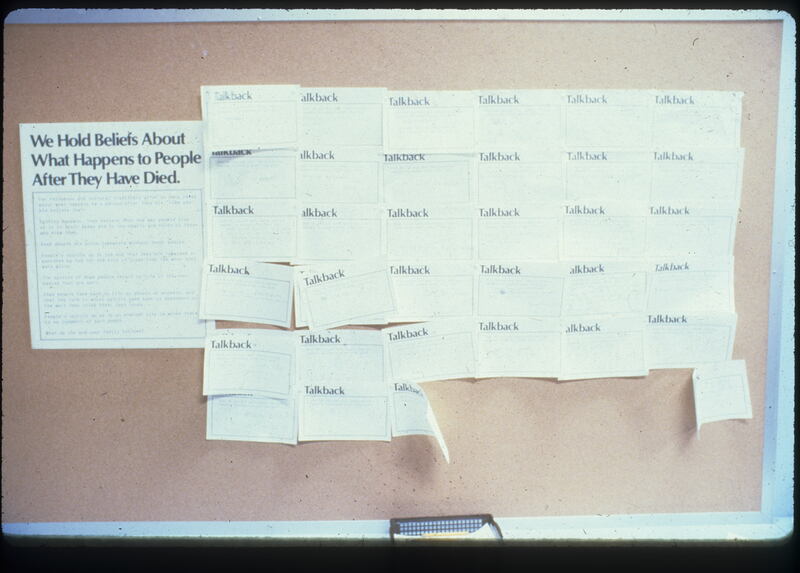 Description: This photograph shows a staff member with a brainstorming chart created during a staff retreat. Description: Comic strip about death and dying. Description: Description of the Endings exhibit at the Boston Children's Museum. Description: Mailing advertising the documentary "Us and them" about disabilities and relationships. Description: Review of "Us and Them," a film about individuals with special needs. Description: Notes from first Advisory Council for What if... exhibit. Description: A staff member and a child use sign language at the What If? special needs exhibit while sitting on the floor and using manipulatives, like a mirror. Description: A young boy reads a description at the What If I Couldn't...? special needs exhibit. 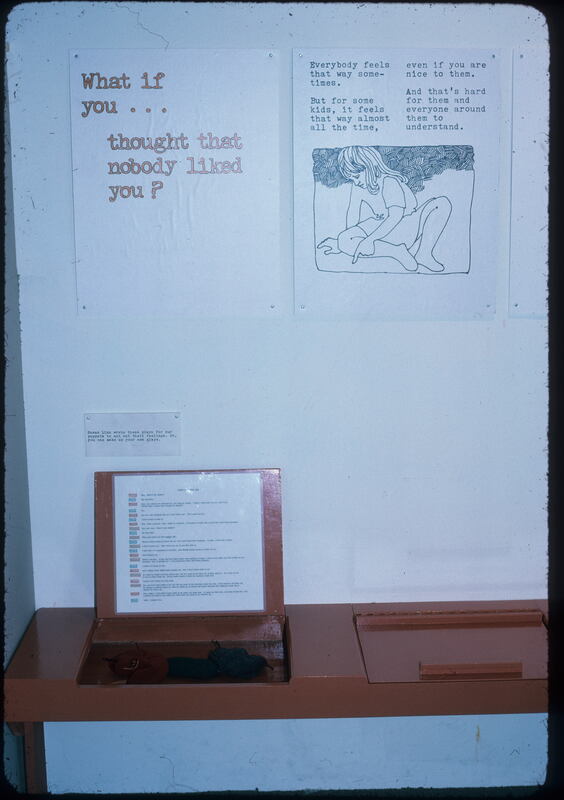 Description: Two sided reminder card, highlighting the "What if I Couldnt..." exhibit. Description: Certificate issued to Janety Kamien from the National Committee of Arts for the Handicapped, thanking her for her contribution to arts programming for the handicapped, recognizing her What If You Couldnt exhibit. Description: The Braille writer featured in the What If You Couldn't...? exhibit. Description: A child explores blindess at the What If You Couldn't...? exhibit by being blind-folded and playing with a ball. Description: Depiction of how talk back boards were included in the What If You Couldn't...? exhibit. 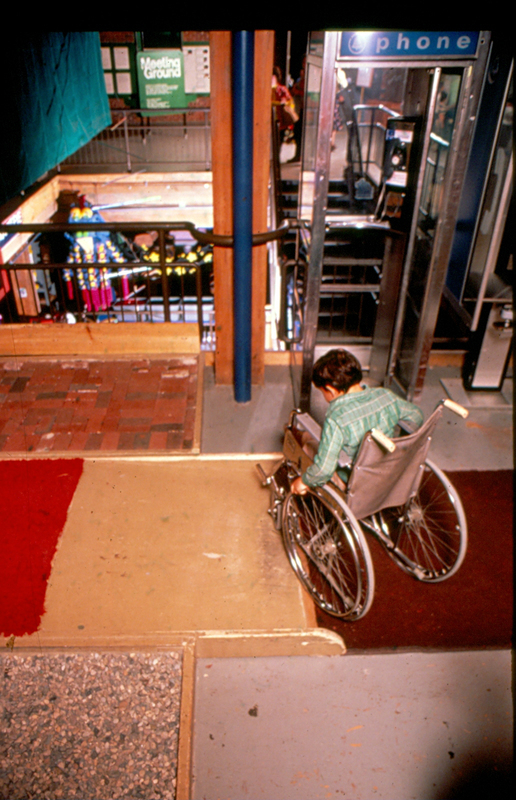 Description: A bird's-eye view of a child using a wheelchair at the What If You Couldn't? exhibit. Description: A photograph that showcases the What If You Couldn't? 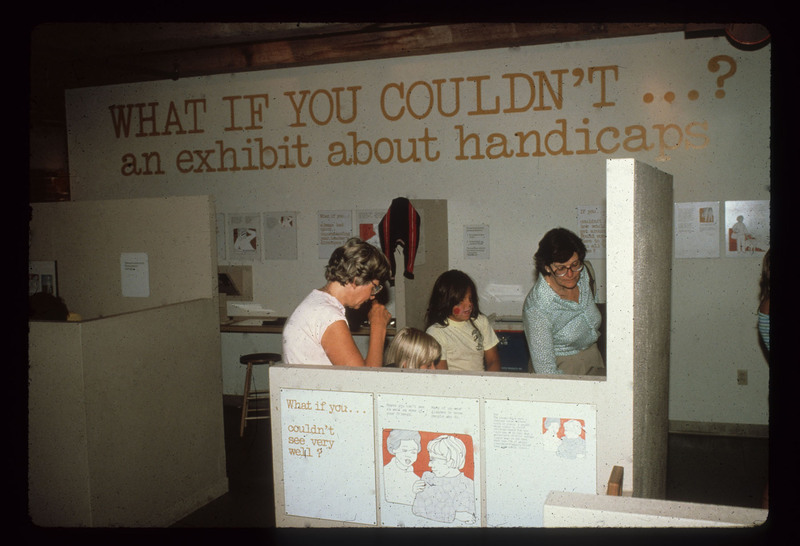 exhibit's ability to prompt self-reflection while considering individuals with special needs. Also includes a close-up look at the design of the exhibit. Description: A photograph of the What If You Couldn't? exhibit. Description: Children explore what it would be like to live with blindess at the What If You Couldn't...? exhibit. The children pictured here are blind-folded, and may be getting assistance from the sighted children gathered nearby. Description: The equipment used in the What If You Couldn't...? exhibit. Description: A close-up of the What If You...Couldn't Hear as Well as Everyone Else? portion of the What If You Couldn't? Exhibit. 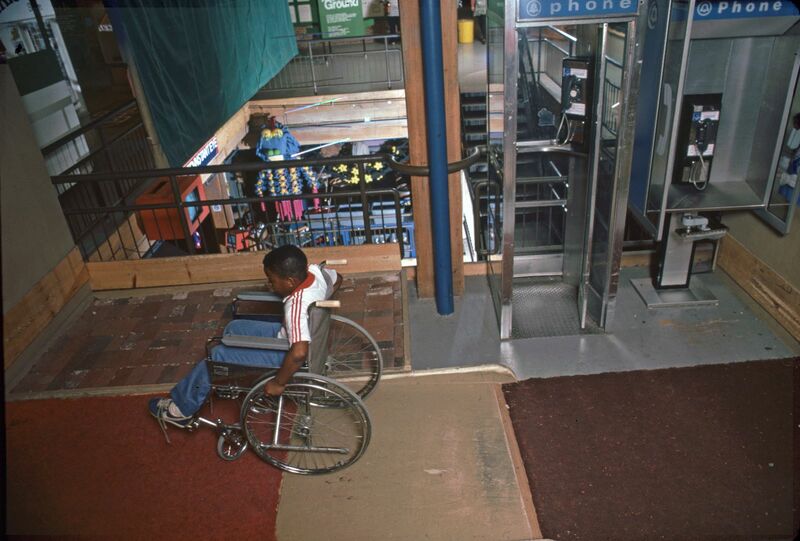 Description: A child uses a wheelchair and elevator in the What If You Couldn't...? exhibit. Description: An adult visitor participating in the What If You Couldn't...? exhibit. The visitor reads about diverse learners under an interactive flap board. 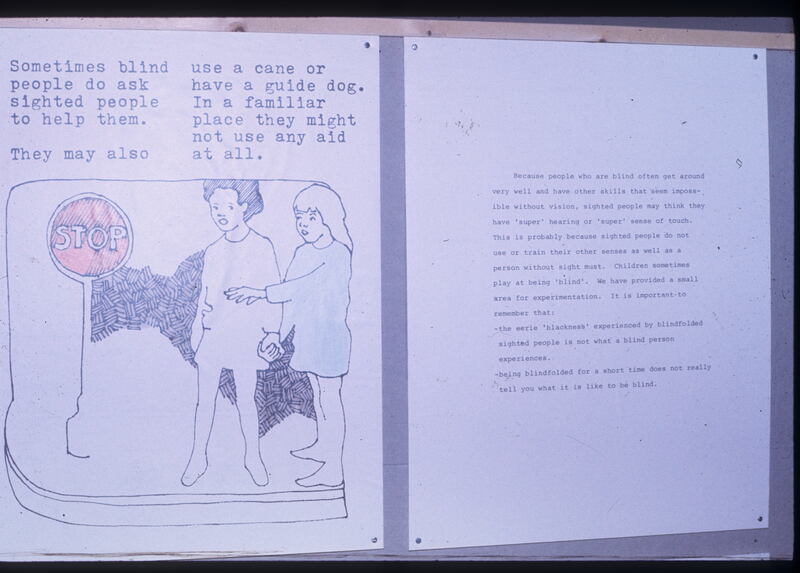 Description: A story board featuring the ways in which people living with blindess are supported by sighted people, as well as seeing-eye dogs and other devices. Used in the What If You Couldn't? exhibit. Description: A series of photographs from the What If You Couldn't...? exhibit. 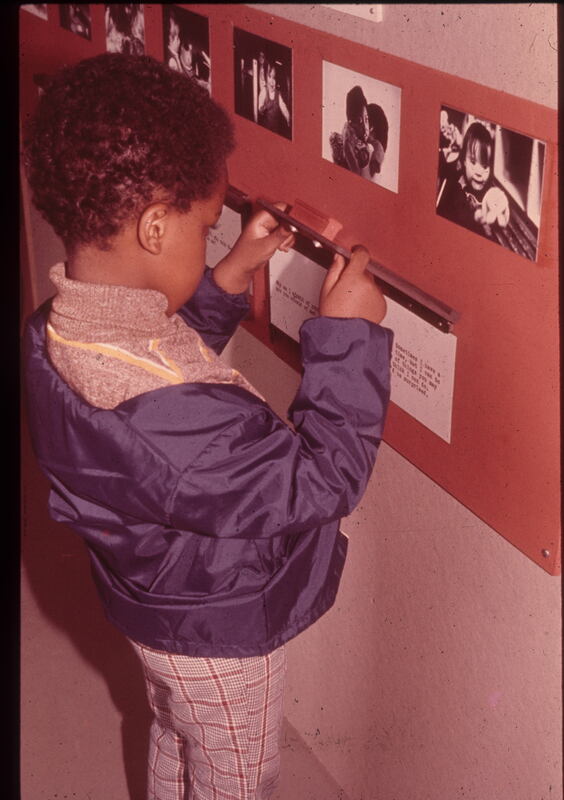 Includes photographs of children using the interactive aspects of the exhibit. 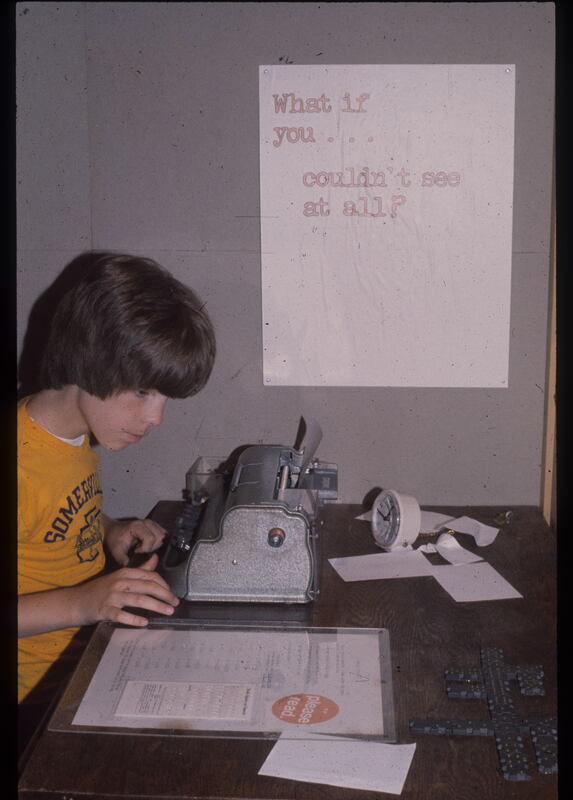 Description: A child uses a braille typewriter in the What If You Couldn't...? exhibit. 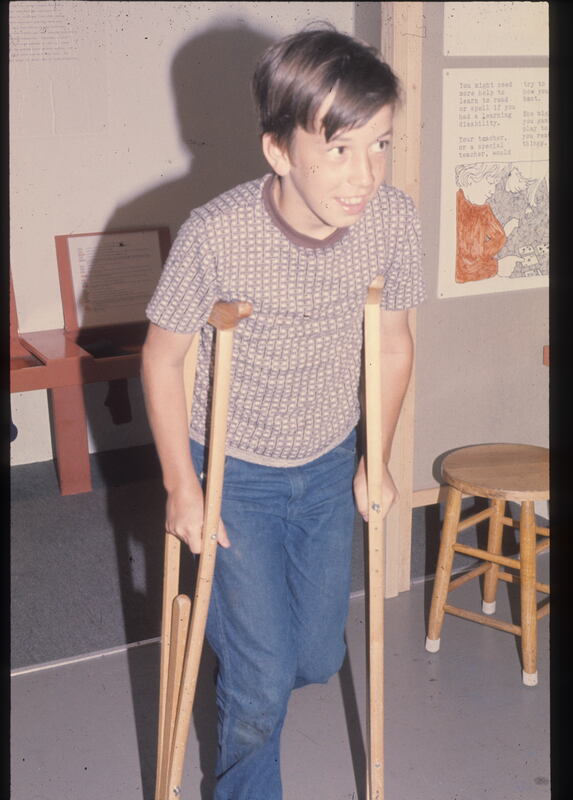 Description: A young boy uses crutches in the What If You Couldn't? 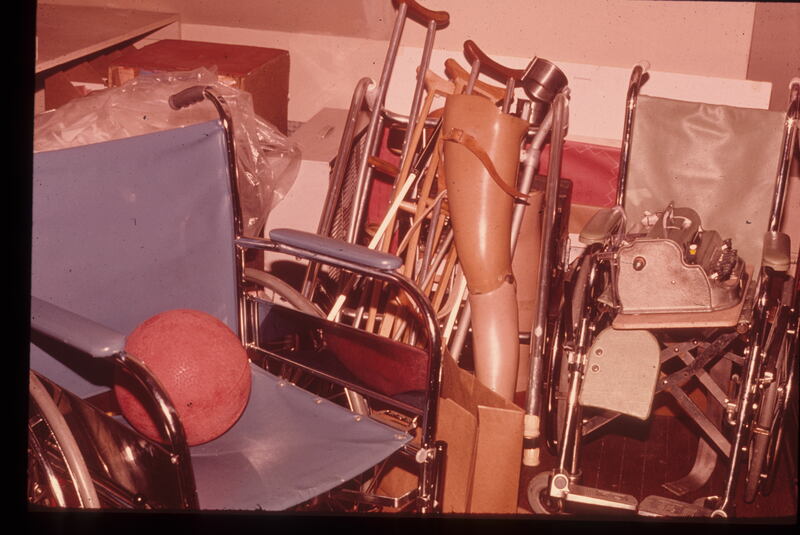 exhibit in order to share in the experience of using crutches with those who use them. Description: A downloadable version of a PowerPoint presentation about the What If You Couldn't? exhibit. Includes many photographs and descriptions of the aspects of the exhibit. 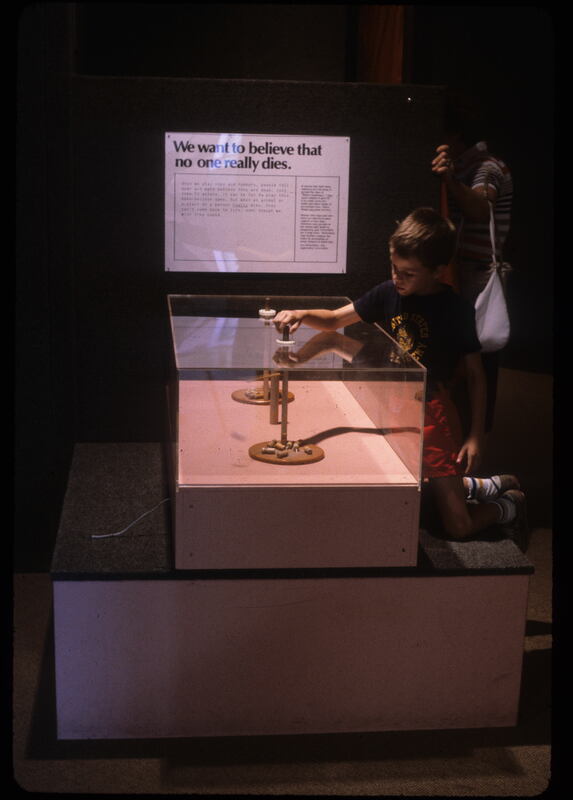 Description: Visitors are pictured using an interactive feature at the What If You Couldn't? exhibit. 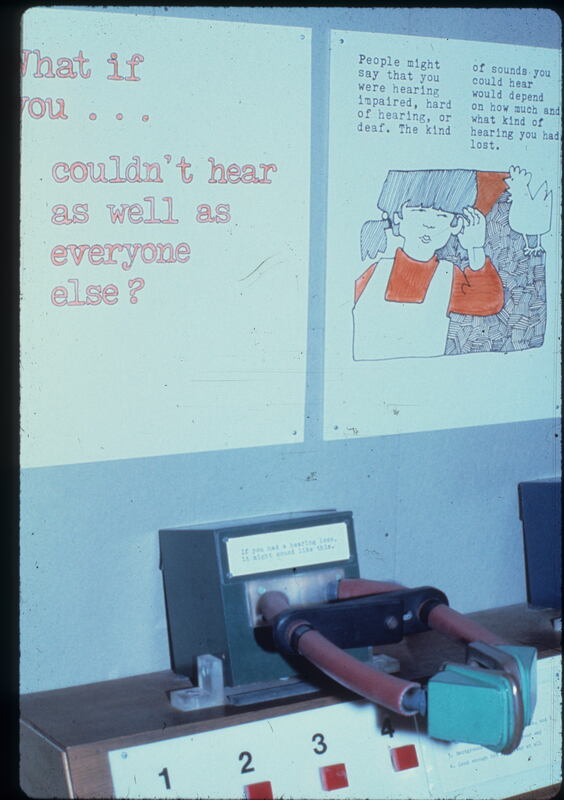 Description: A photograph of a story panel featured in What If You Couldn't?, which asks children how having a disability might change the way they have fun. Description: A photograph of the hearing section at the What If You Couldn't? exhibit. Interactive features are included in photograph. 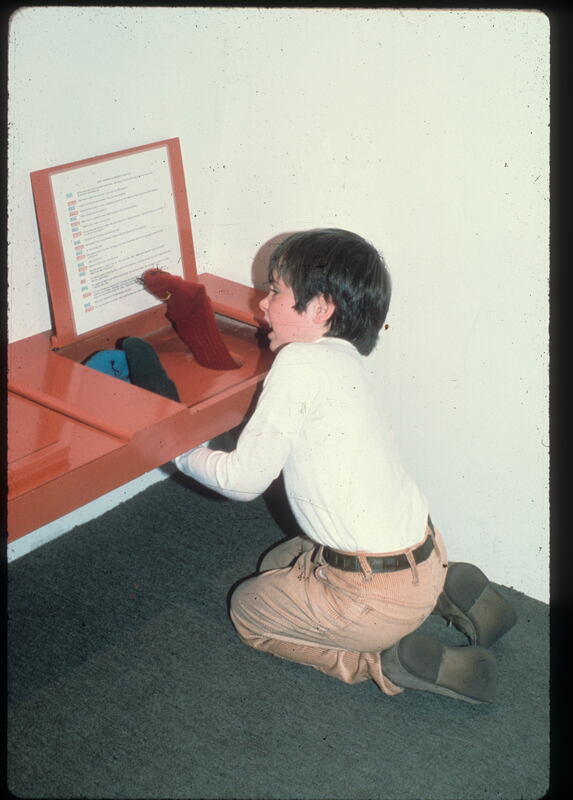 Description: A young boy uses interactive puppets at the What If You Couldn't? exhibit. Description: A child uses a puppet interactive featured in the What If You Couldn't? exhibit. Description: A full-view of the interactive puppets featured at the What If You Couldn't? exhibit. 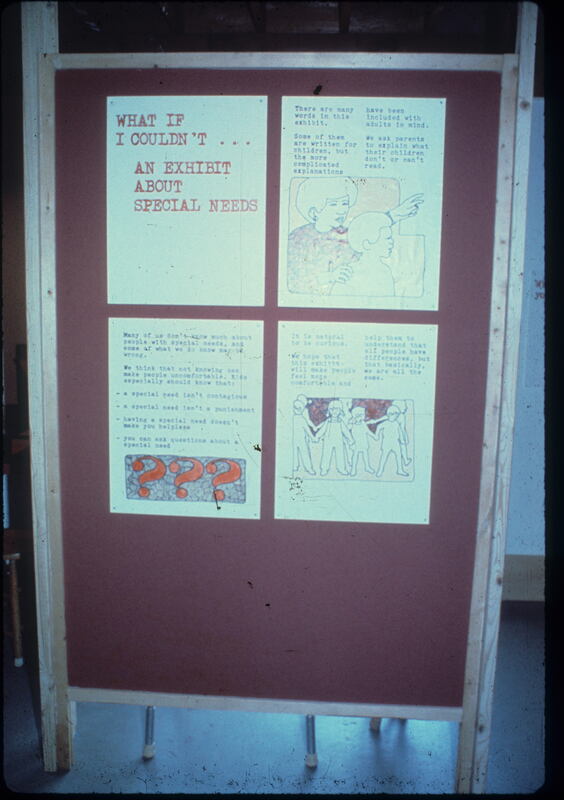 Description: This photograph shows another view of the introduction panel at the What If You Couldn't? exhibit. Description: A photograph of one of the introduction panels at the What If You Couldn't? exhibit. The photograph also features both child and adult visitors. Description: A close-up of a section of the What If You Couldn't? exhibit, where visitors are encouraged to think about the question: What if you were smart...but you always have trouble understanding your teache's directions? Description: Two visitors using the puppet interactive at the What If You Couldn't? exhibit. Description: A photograph of the introduction to the What If You Couldn't? exhibit. Description: A photograph of the What If You Couldn't? exhibit, where children are invited to think about what it would be like to live with a disability and feel as if others did not accept or understand you. Also features a close up of how the exhibit was designed and constructed. Description: A photograph of a story board used in What If You Couldn't? The story board includes a reflection about children about their experiences living with special needs. Description: A close-up of a story board panel in the What If You Couldn't? 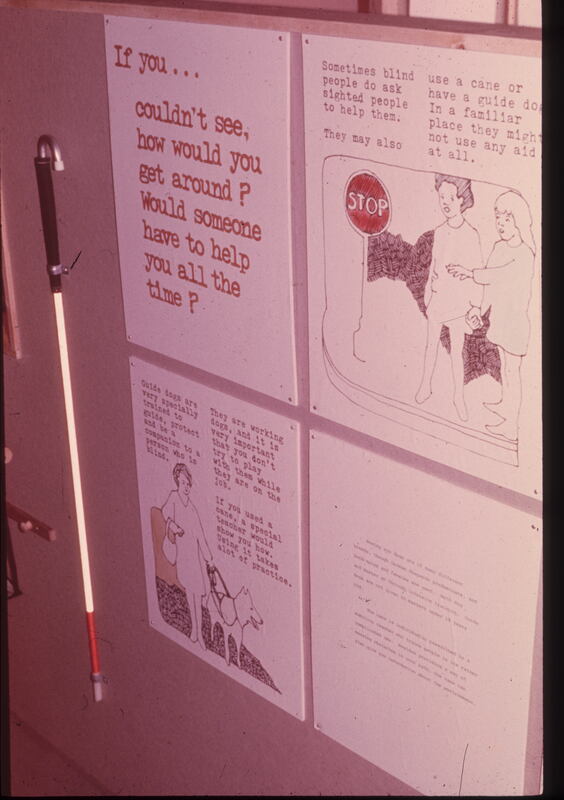 exhibit, which features a section on living with a vision disability. Description: A photograph of the What If You Couldn't? 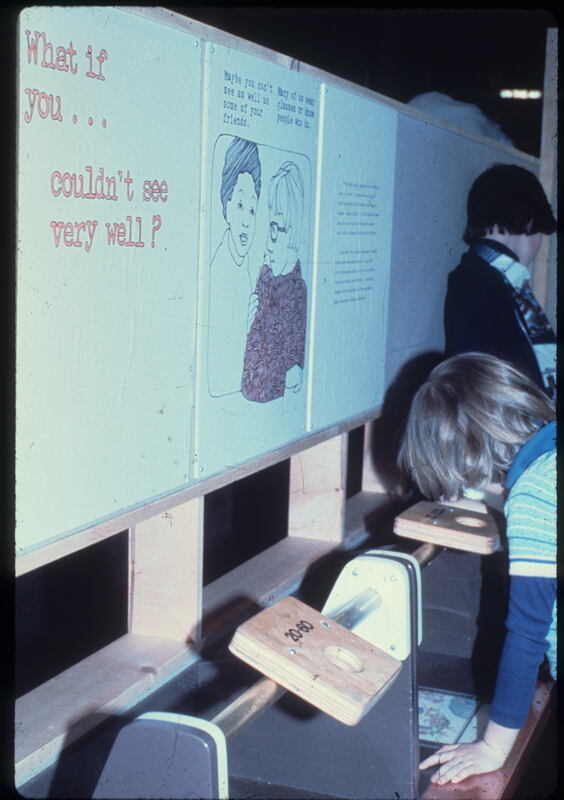 exhibit, where a child uses the interactive features of the exhibit used to explore vision disabilities. Description: A full-text version of Janet Kamien's What If You Couldn't? A Book About Special Needs. This text provides insights into what it might be like to live with a special need. Description: Proposal for training requirements of Children's Museum staff members regarding accessibility for handicapped individuals. Description: Article describing the What if You Couldnt...? program at Malden Public Schools. Description: Review in "Museum News" of Janet Kamien's book, "What if You Couldnt... A Book About Special Needs." Keywords: publicity, review, what if you couldnt? Description: Big Box Exhibits flyer describing the "What if You Couldnt...?" exhibit, specifications, and fees. Keywords: flyer, promotion, exhibits, travelling exhibits. Description: A young child on a telephone, part of the What If You Couldnt...? exhibit. Description: An essay written by Janet Kamien titled What's Mentionable is Manageable: Dealing with Sensitive Topics in Children's Museums. Description: Janet Kamien's Whose Fault is it Anyway? explores who's responsible for making museum exhibits and facilities accessible for all museum visitors.